Or let’s just cut to the chase and say four and a half months later the basement is a work of art–even though it killed me to have to pay for it. We have new beams, sills, lally columns (don’t get me started), and stairs. The leaky bilco door is gone and french drains were installed thanks to Mike Papa, mason extraordinaire, and a genius when it comes to stemming the tides that afflict aged foundations. They definitely need him in Venice. While he was poodling around in the basement The wizards at Whizzer Construction LLC were shoring up the remaining floors. Literally. The kitchen floor was completely rotten, as was the floor in the bathroom upstairs. Meanwhile the electricians were busy rewiring the entire house! 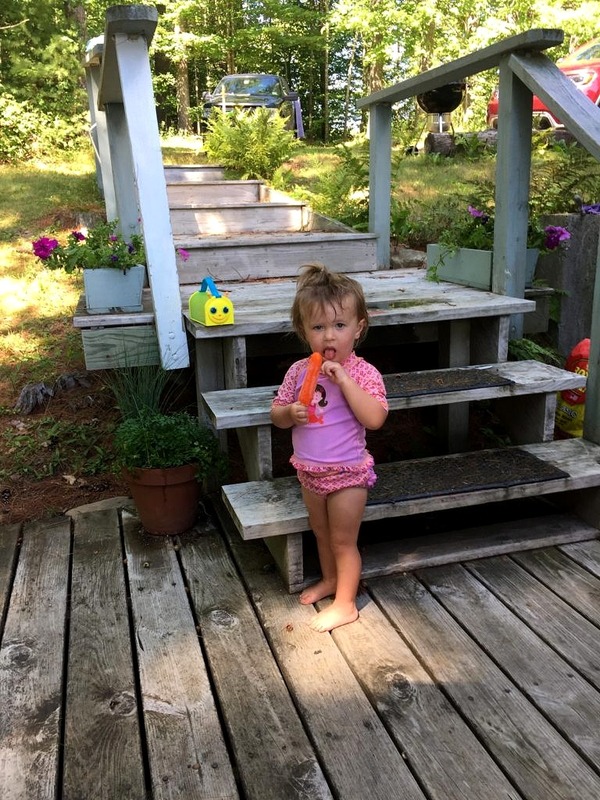 And the HVAC (Heating Ventilation & Air Conditioning) team was on the job, while our intrepid plumber and his tireless helper (Keith) installed all new plumbing throughout the entire house. Most people would have a GC or General Contractor on the payroll to oversee the machinations of all these sub-contractors, but not me. Maybe I could with a new house, because you would know where things are going to go right from the start. But with a renovation like this it is hard to foresee what will be required on any given day. And I want to make all those decisions myself. Which means I can change the layout of the upstairs laundry–and change it back again without it being such a big deal. Of course there is a lot of eye rolling and it has been duly noted that Keith has the patience of a saint, but I think it has generally gone well. The carpenter and the plumber did join forces and gang up against me on my plan to use a tile floor in the downstairs shower. I’ve done it in other houses. You place a waterproof mat down, then tile over it, but my plumber was convinced it would leak eventually so he found another couple of inches so we could use a manufactured shower pan. Anyway, I’ll keep this short because unless you are in the thick of it, this part isn’t the most interesting. In the upcoming weeks we will sheetrock the walls, and then tile, install the kitchen and then the real fun begins–decorating! 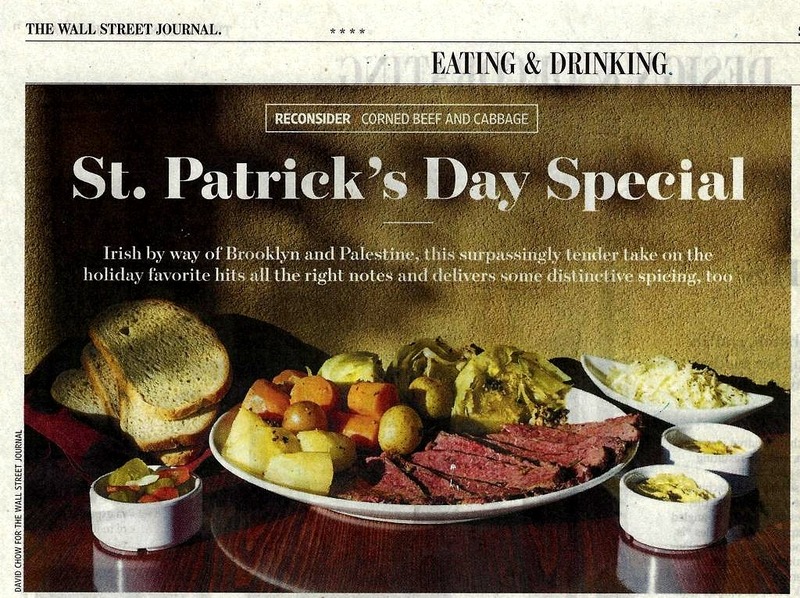 Meanwhile the hero of this renovating saga needs to be fed so in honor of our beloved St. Patrick, I will share with you a delicious new twist on that annual culinary ritual, Corned Beef and Cabbage. The reality: We’re about 14 weeks and four dumpsters into our project. My original plan was to be finished by March 1–not going to happen. Right now, as I type, there is a crew in the basement installing internal french drains. Who knew Fair Haven was built over a series of underground streams? And who believed their seller when he said all the wet basement issues were resolved when new drains were installed in the road a couple of years ago? So unlike the tv Fixer Upper where whole homes are renovated in what seems minutes, we are well into our 280th hour of hard labor. And boy have we’ve learned a lot along the way. You know how in Fixer Upper Joanna says to Chip let’s take the wall down between the kitchen and the dining room, and it happens lickety split? That’s so not true. 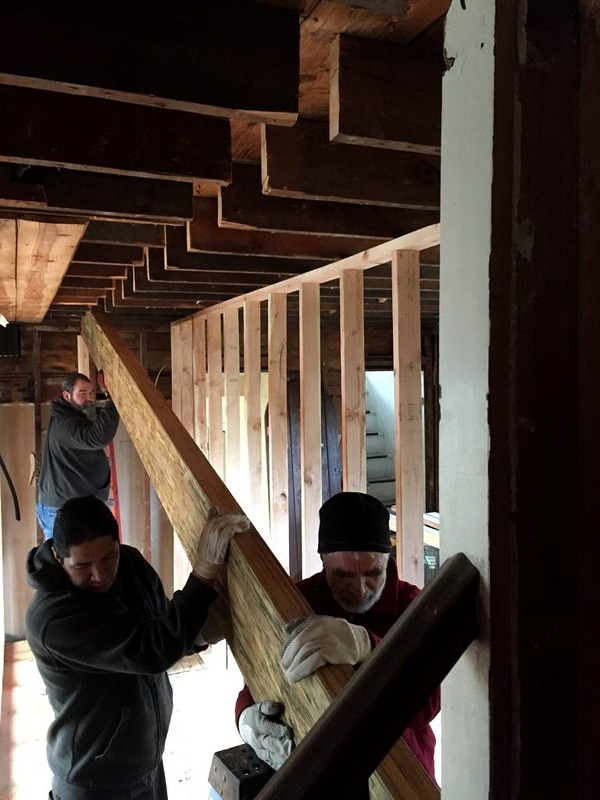 Besides all the architectural drawings and building permits required, in order to take a load bearing wall down first you have to build a wall–in fact two walls–one upstairs and one downstairs in the basement to support the wall being removed! Who knew that? And then you need to round up at least four really strong guys to wrestle the new beam–called a microllam–into place. Voila. Ironically once we got the new beam in, and replaced the rotten sub flooring in the kitchen so we could set the headers (wooden things that support walls) for the new windows just in time for their delivery date… The truck, delivering the new windows, rear-ended someone en route to our job and one of our kitchen windows got broken–oops–too bad. So not only do we have to wait another month for the replacement window…we will have to pay our guys to come back and do the install. Oy vey already. The good news is the rough plumbing is done–inspection on Thursday. The bad news is the inspector is coming between 8 and 2. No heads up phone call which means yours truly will have to sit there and freeze to death because clever Keith has scheduled deliveries for himself that day. 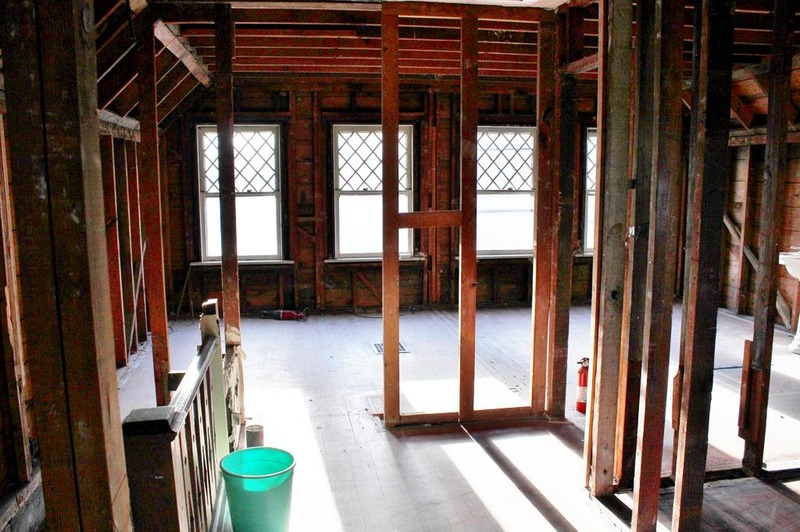 We added a master bath; a bold move seeing as we are now losing access to the balcony overlooking the great room. But I decided, knowing my family, someone would probably end up falling from it at a possibly alcohol fueled moment anyway, so safety and a bathtub trumped moonlight serenades. That is part of the struggle when wrestling an 89 year old house into modernity. Some character is invariably lost along the way. Hopefully we will be able to make up for it when we get to the decor. 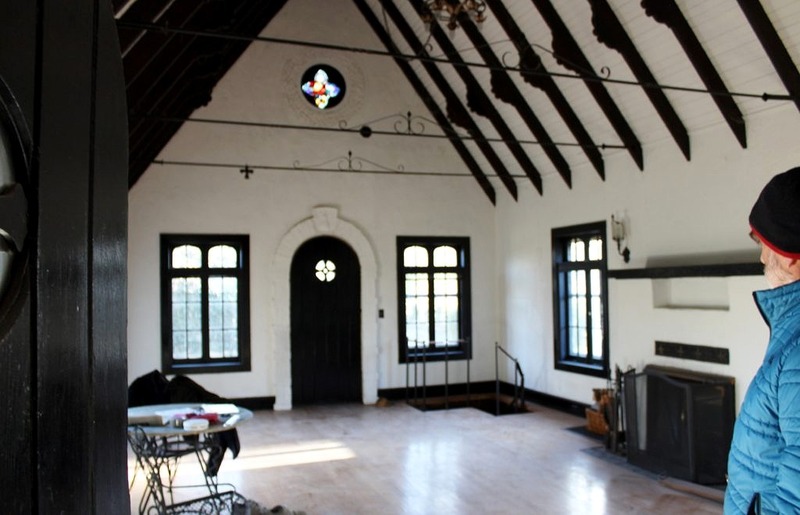 Fortunately the great room will be a breeze to decorate and certainly something I have been looking forward to. 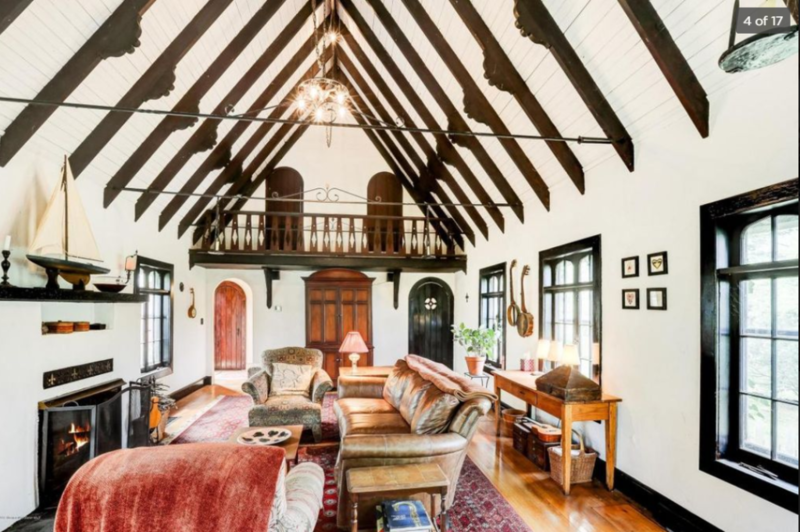 So many decisions to ponder: tv over fireplace or on sidewall, ceiling fans or chandeliers, whether to open up the arched back door, sectional or a grouping of sofas, the list is endless. 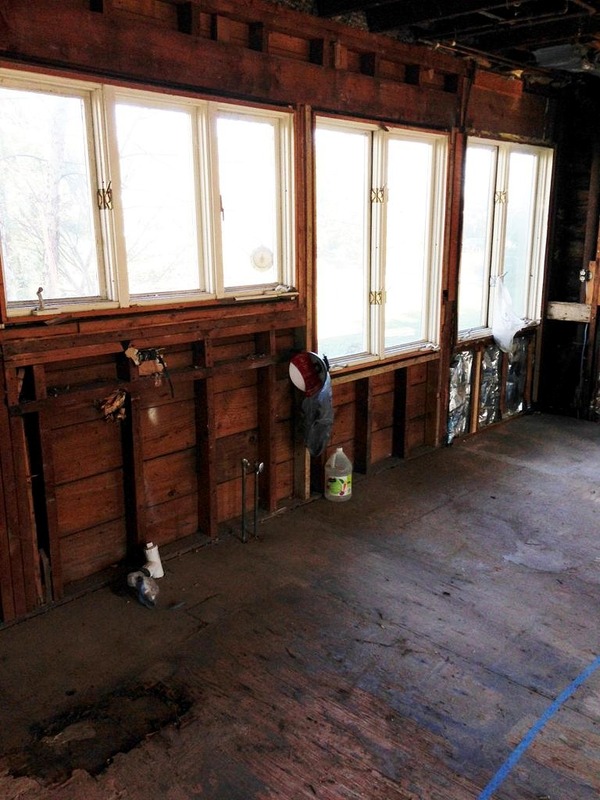 One thing we do know is we are restoring the hardwood floors throughout the house. 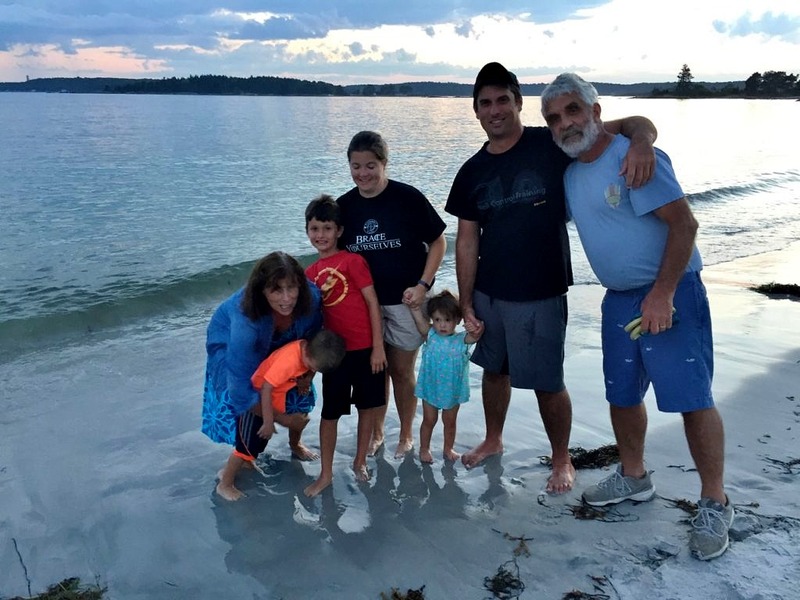 And have hired Beaton Brothers in Lakewood to do the job… My maiden name is Beaton (I like to think I am getting the family pricing and they do nothing to disillusion me). 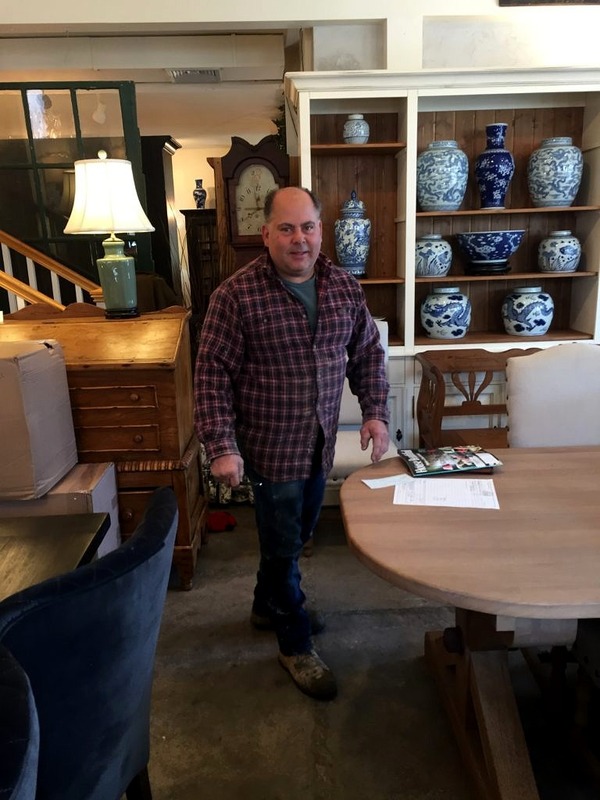 Dave Senior was the mastermind behind the floors in our first store at 126 Shrewsbury Avenue in 1989, the 2004 renovation, the 130 Shrewsbury Avenue remake and any number of our Rumson homes. 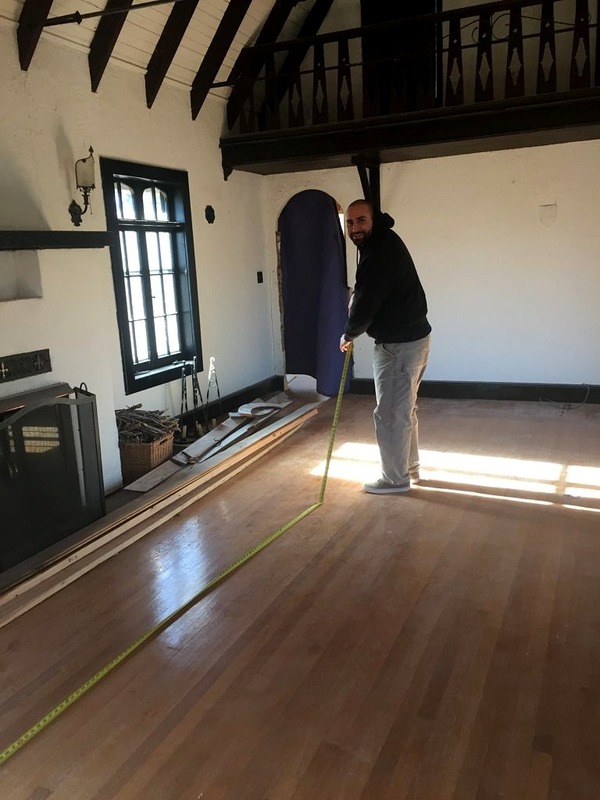 This is Dave Jr measuring up the great room. So along with progress comes an appetite. All anyone (in our case usually Keith) cares after working in a freezing cold house all day is a hot meal and a beer. And what goes better with beer then pizza? 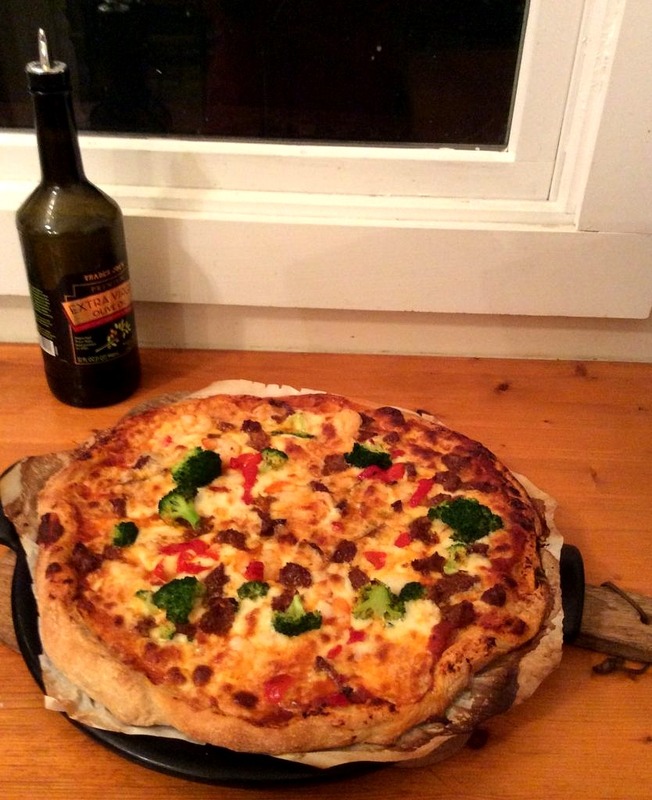 In order to make great homemade pizza, you need the right equipment–not a pizza oven but a good pizza stone is key. First cut some parchment paper into the shape of your pizza stone–then put the stone into your oven and turn the heat up to to 425 degrees. Next sprinkle the parchment paper with a dusting of cornmeal (key) then roll out your dough*, I buy it fresh from Trader Joe’s , (try to remember to take it out of the fridge 20 minutes or so before you are ready to roll). You just need to schmear the dough with tomato sauce–another key thing to remember is not to over-sauce–add a ton of grated cheese, and whatever you like in the way of toppings: crumbled hot or sweet sausage (cook this first), shrimp (toss a dish of raw shrimp in a bath of butter, garlic and hot pepper flakes in the oven while it is heating until they are slightly pink and you will thank me forever), broccoli (I put this in the microwave for about a minute first), red pepper, green pepper, onions, olives–basically whatever you have in the fridge. Now here comes the tricky part. You have to get the pizza, on the parchment paper, onto the burning hot pizza stone. I usually let Keith handle this–then cook for about 10 to 15 minutes. That’s it. 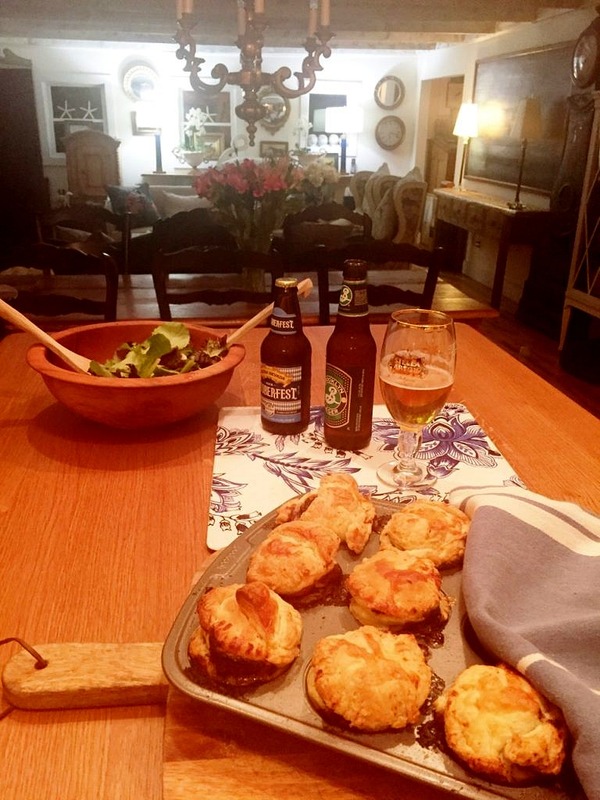 Slice it up, pour some more beer and enjoy–simple as pie. * There is no point debating whether truly fresh homemade dough is better–of course it is. After two months we have accomplished nearly all of what Chip and Joanna Gaines do in the first five minutes of their TV show Fixer Upper. What you don’t see on television but face in a real-life renovation is mountains of paperwork and red tape. 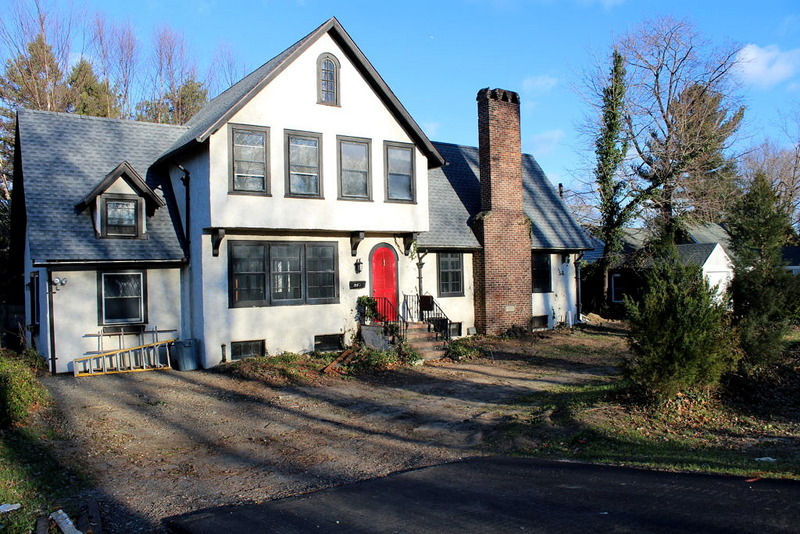 Nothing happens in the town of Fair Haven New Jersey that does not require an application, an inspection, a fee–and, in all probability, another inspection. We started with the tree growing through the basement wall. In order to remove it we had to submit a request to Bill Brooks, the Town Arborist, and once that was approved, get his okay on the required replacement. (Bill is practically a walking encyclopedia when it comes to trees and an absolute delight to talk to.) 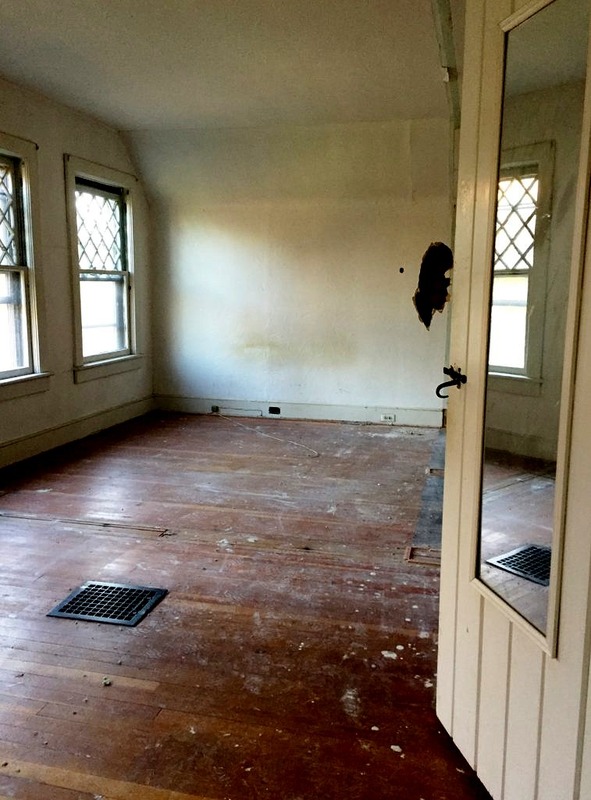 After Bill came the permit for non-structural demo–all that old sheetrock and cabinetry tossed in the dumpster had to be accounted for. 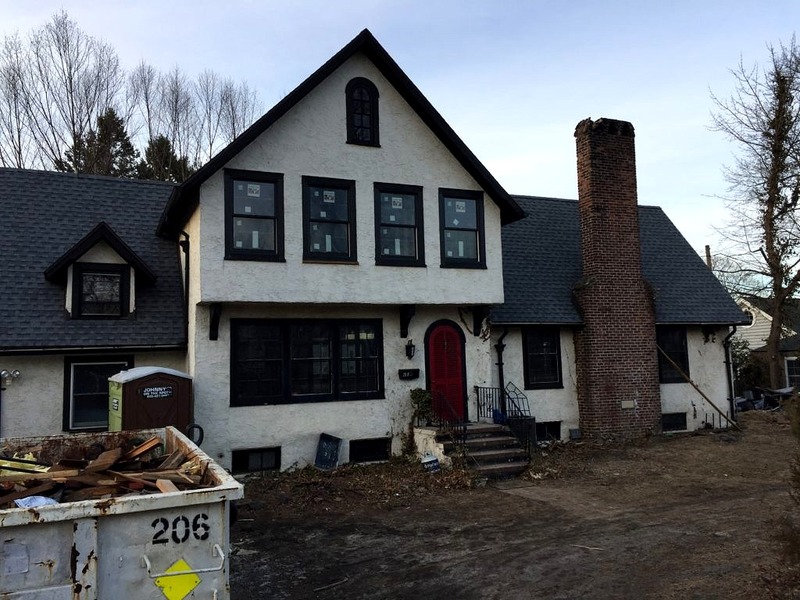 Next, because our cottage lies in Fair Haven’s designated historical district, came the application to replace the rotting windows upstairs. 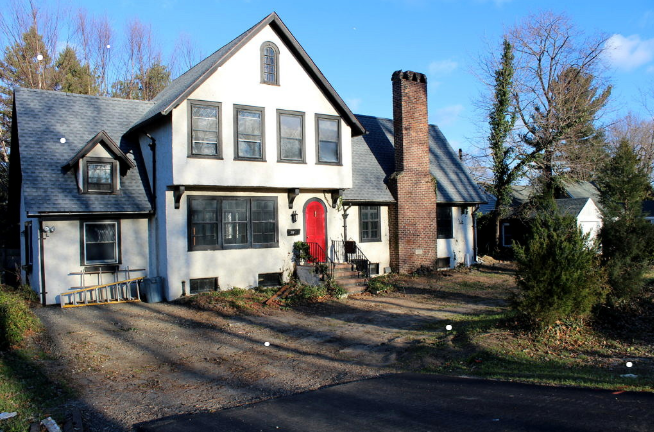 That was most involved, requiring an actual in the flesh presentation to the board members of the Historic Preservation Commission so they could make sure we were not wreaking havoc upon the unique character of the neighborhood. 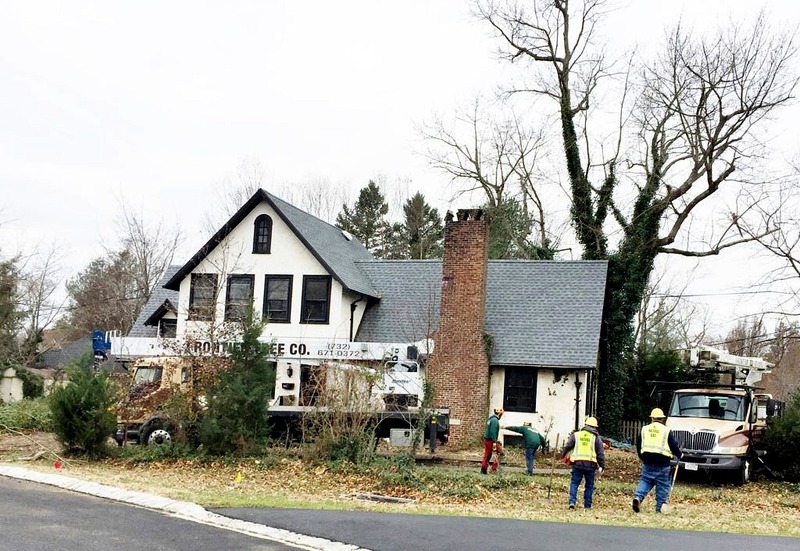 While you really have to admire their efforts, the selfless donation of time and energy in order to preserve what little is left of New Jersey’s unique past, it was still a wee bit frustrating to add another week–or two–to our project. 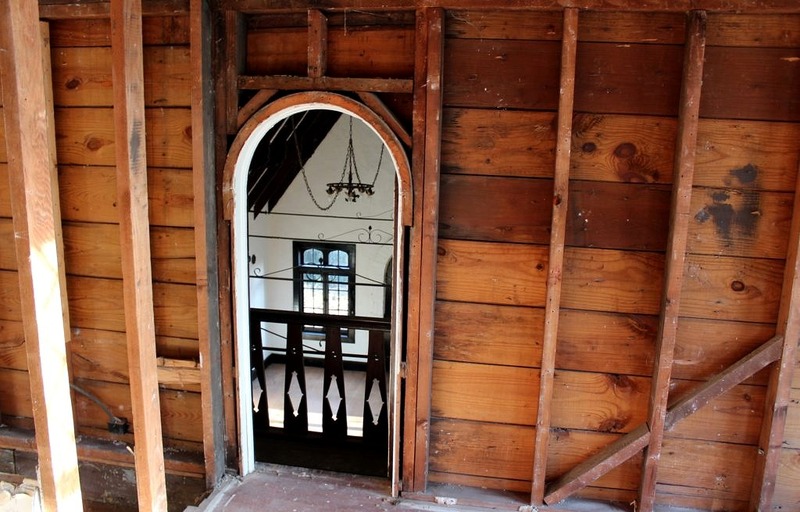 The good news is our new windows passed muster and are on order–and should come in–in three to four weeks…darn. 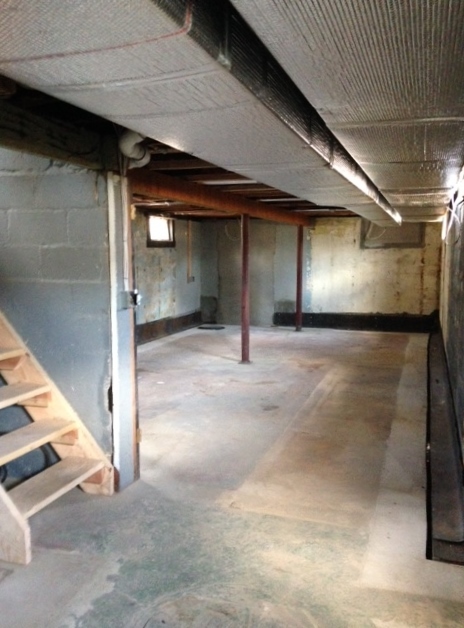 After that came the building permit required to replace the totally missing metal support columns in the basement that were naively removed–in the days of yore–when homeowners were trusted to make and live with, their own really bad decisions. You have to admire the way a structure stays up when logic would decree collapse was imminent. How did this not all come tumbling down? 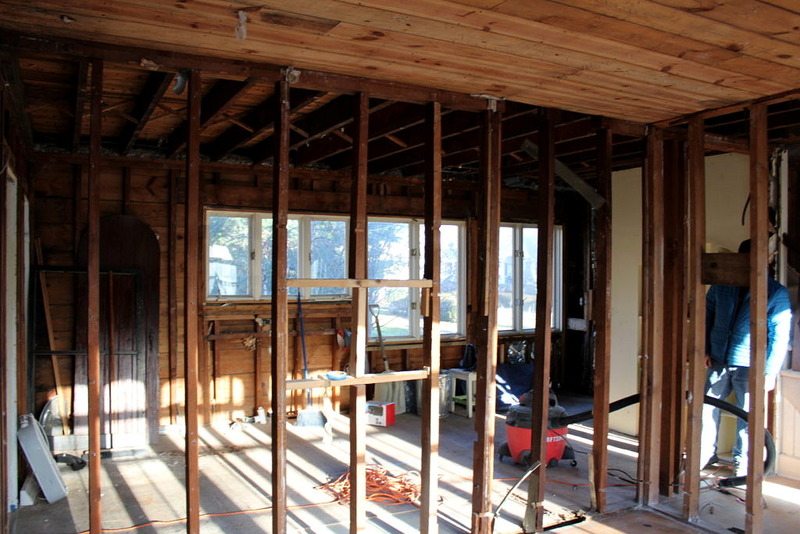 Right now we are waiting for a permit to do further structural work–remove the wall between the kitchen and dining room. (Sadly the little hobbit hallway had to go.) 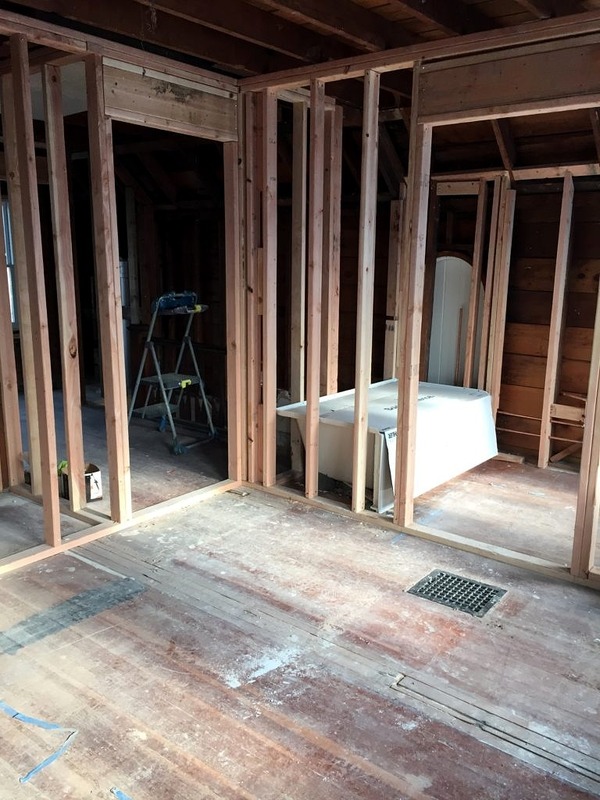 Then we need to frame in a second bathroom in the master bedroom and rework the windows in the kitchen area. And let’s not forget the permits for all the new plumbing, electrical and HVAC work. 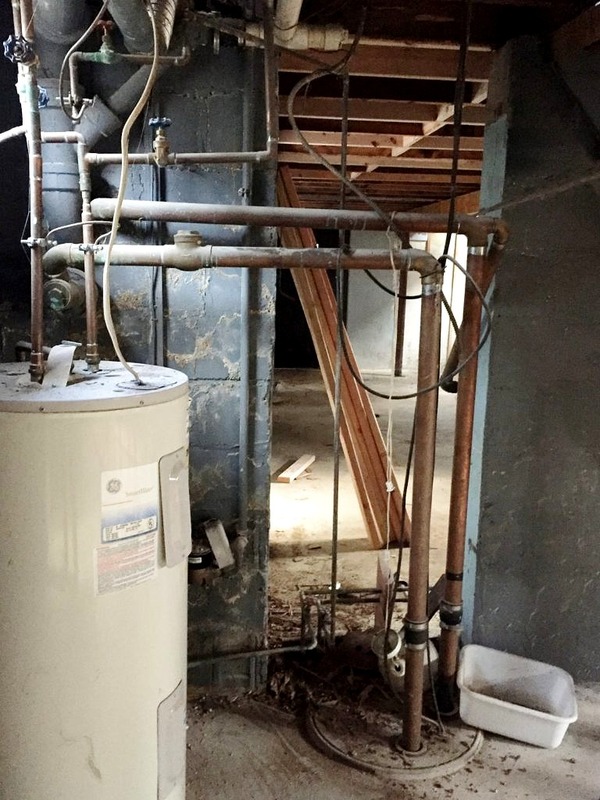 We inherited a potentially lethal combination of systems dating back to 1930 that include lead piping and a heating ventilation system for the upstairs bath that was duct taped into place. The most amazing thing is that the house did not burn down years ago: there were live wires in the walls, the ceiling, even outside the back door! So the good news is we will be able to sleep soundly when we finally move in. The bad news is that all these updates take time, more time, and of course, more money. 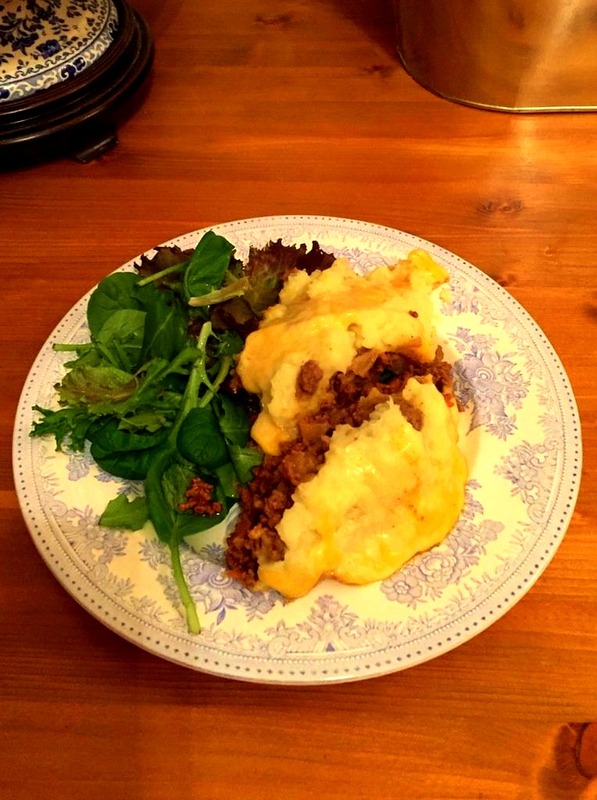 Fortunately, Keith is crazy about Shepherd’s Pie because it’s hamburger for dinner chez Nelson these days! First peel five or six good-sized potatoes, quarter and bring to a boil, then simmer for 15 or 20 minutes until fork tender. Toss in a clove or two of minced garlic and, although I am not a huge fan of cooked carrots, Keith is, so I grate a couple of raw carrots into the mixture so they essentially dissolve–and I might add some diced mushrooms if there are any moldering away in the fridge. Then stir in a couple of teaspoons of tomato paste, a healthy dash of Worcestershire, and if you like some rosemary, thyme, salt, and pepper–how much is up to you really. Err on the side of flavor. Cook on low heat until your potatoes are ready to mash. Spoon mashed potatoes over top and then a couple of cups of grated cheddar cheese–the more the better. Bake 20-25 minutes in a 400-degree oven until bubbly. Ignore all those people who say you need to add peas or corn to this dish. Totally unnecessary because if you are British that means you are having peas as a side dish anyway. (Nobody else likes peas). And there is no justification for having corn–with potatoes–no matter how good it tastes. Let cool because the potatoes are really, really hot when they come out of the oven. Serve with a green veg or a tossed salad–and a pint of course. 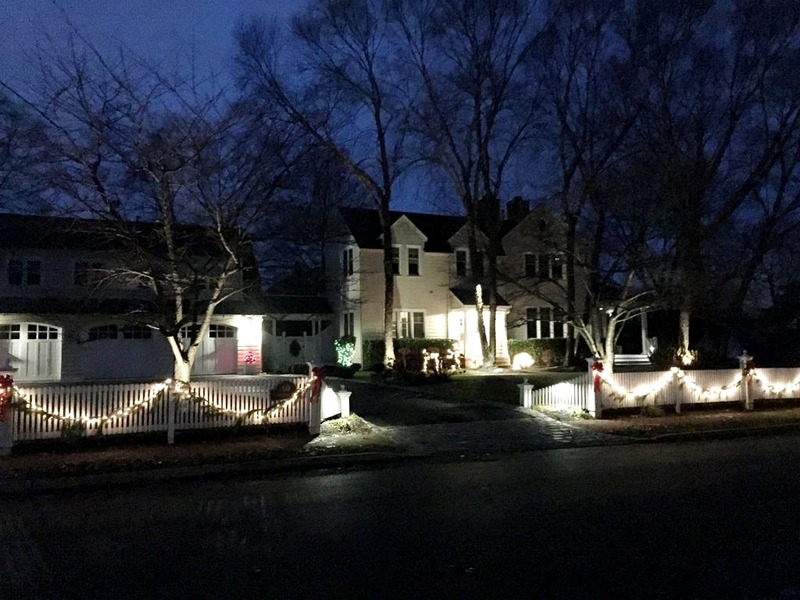 As we approach the holidays our neighbors’ homes in the Fair Haven historic district really shine. Meanwhile, at Chez Nelson, the lights are barely on. Just past our first month’s anniversary at 28B Gillespie, an optimist would say wow, we’re nearly there. A pessimist might not. 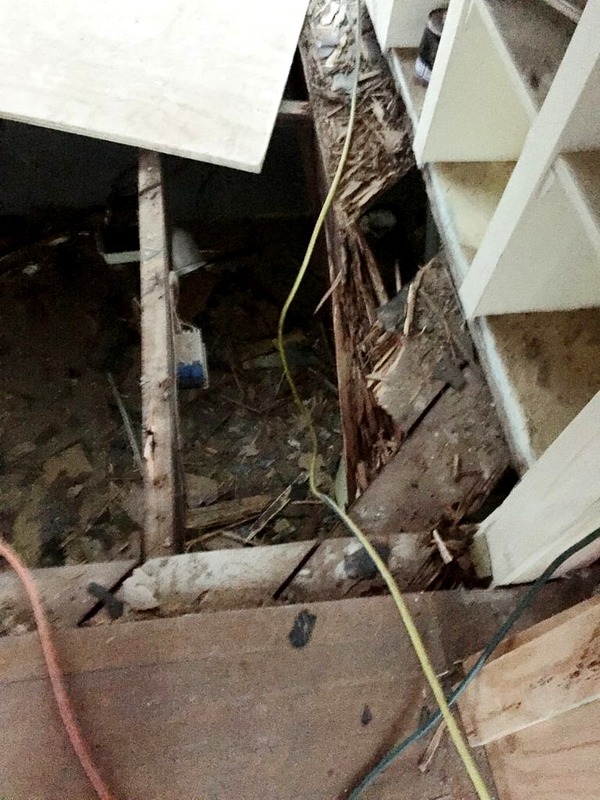 It took us at least four weeks just to round up Kevin Slavin, the very busy owner of Frontier Tree, who, along with his mighty crew, skillfully removed the gargantuan maple tree that was growing through our roof–and–into the basement. But now, with the tree gone* a lot of other tasks are falling into place. We can finally access the basement through our Bilco door (that slanty thing on the back of old houses). We’re planning on replacing the oil tank and furnace currently residing down there with a natural gas-powered heating and air conditioning system. It gets a little complicated because we have to install all new ductwork and that can be challenging in an older home (I really want to say it isn’t easy getting all our ducts in a row). Anyway, once we switch out the heating system we won’t need an outside entrance so that wall gets closed up and the dreaded Bilco door removed. Right now it’s sitting outside the great room just where the veranda should, and eventually, will be. After that all we’ll need to do is upgrade the electric and a bit of plumbing, add some insulation and sheetrock. 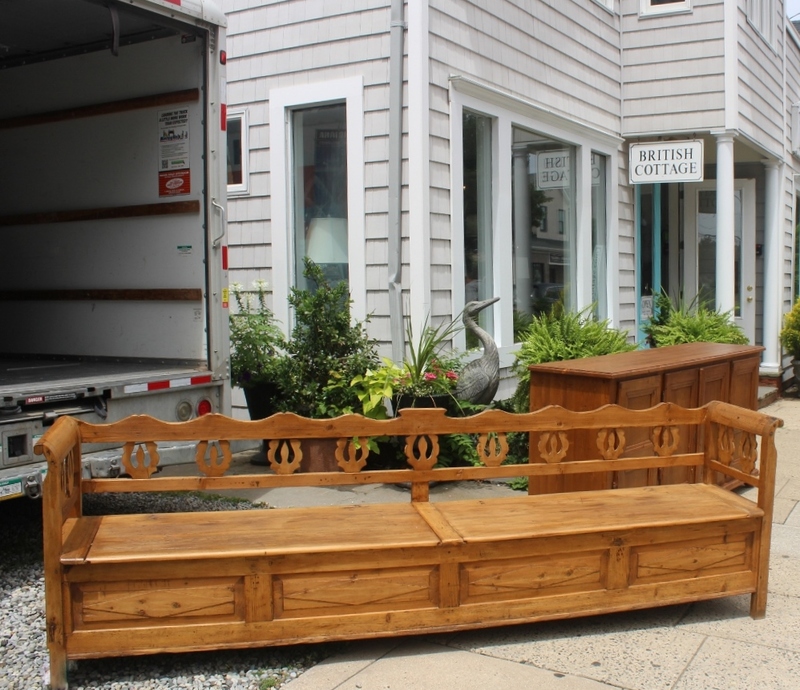 Meanwhile, I have been doing the rounds of kitchen cabinet vendors; big box stores, local building centers, and custom cabinet shops have all been on my itinerary. My plan is simple: the core of the kitchen will be on one wall. Eventually, we’ll have a custom island and hutch built at the factory that makes all of our furniture in Hungary. Here’s my inspiration kitchen courtesy of Joanna Gaines. This is the core plan. And this is the reality. Sigh. 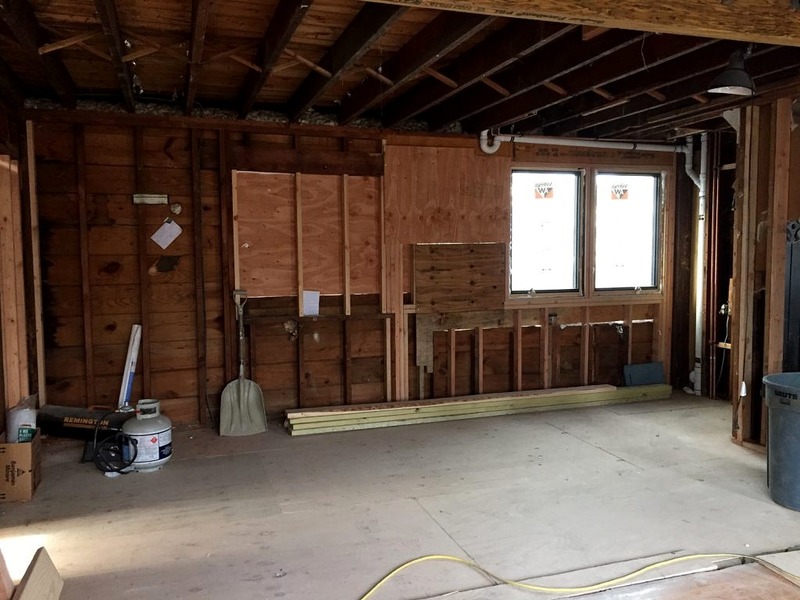 Meanwhile, I need to keep Keith’s spirits up–I may be the plotter and planner but he is the guy on the spot: filling the dumpster, peeling old insulation and sheetrock off the ceiling and walls and removing the ten thousand nails used to secure same. 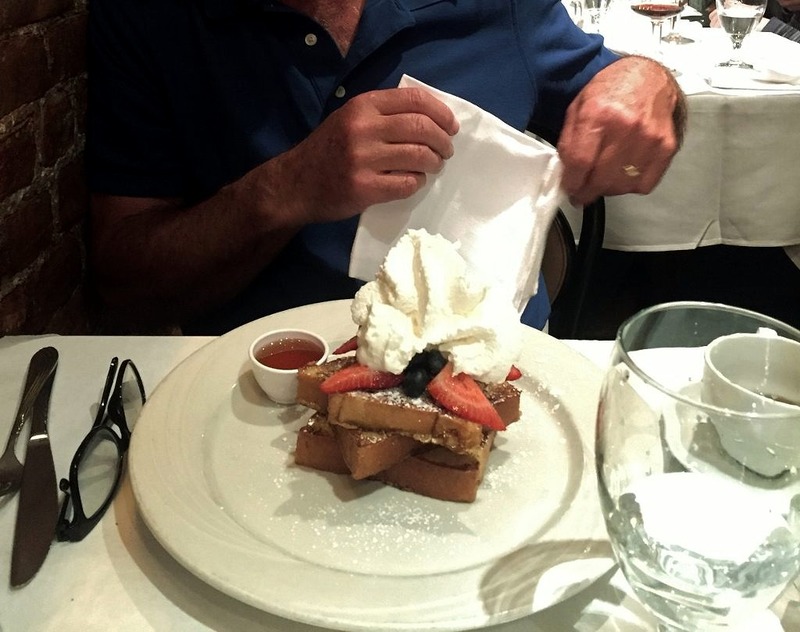 Luckily for us, the way to this man’s heart is through his stomach. He needs to be fed and fed well. I always pick up a rack or two of lamb every time I go to Costco and toss them into the freezer for when I need to up my dinner game. Pull off most of the fatty bits but don’t worry too much about the gristle. Pour a few glugs of soy sauce and a largish splash of maple syrup into a shallow bowl and toss in the lamb. You can do this a few hours in advance, or a half hour depending on how organized you are. Turn at least once. Cook in a preheated 425-degree oven for 20 minutes and then test to see if the lamb is done. The only way I know how to do this is to actually make a small incision. Although I suppose, if I could ever locate the meat thermometer, that would be a less invasive way to test for doneness. Pink is okay, raw is not. So either take the rack out of the oven and let it rest for a few minutes before serving or put it back in the oven for a bit. Keep an eye on it though because you can get to well done very quickly. Then open a lovely bottle of Cote du Rhone and enjoy. *In Fair Haven trees don’t just don’t go away. 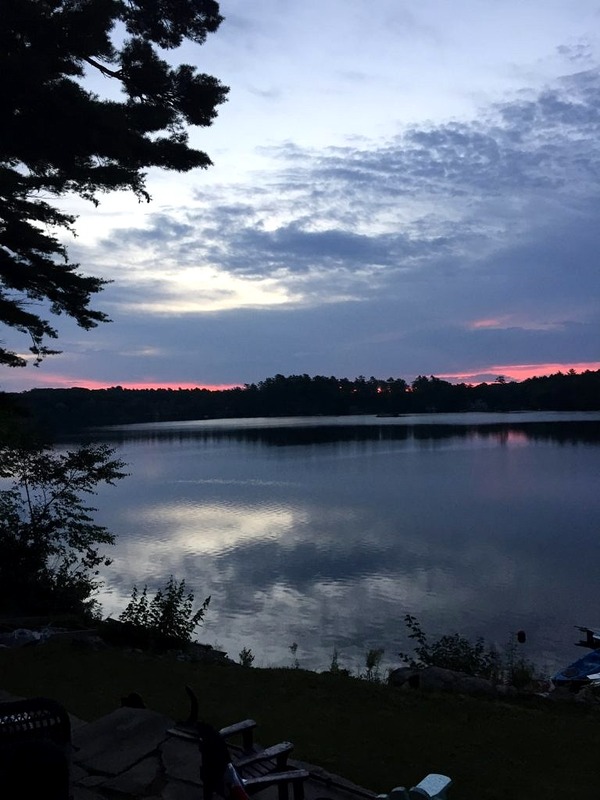 Removal requires a permit application, site visit by the town arborist, a fee, and a commitment to plant replacements for the trees that were removed. **Note I did not mention mint or mint sauce once. This is the darkest hour when renovating a house. You’ve signed off on having any disposable income for the next thirty years and been given the keys to your dream home that is suddenly, woefully less than perfect…On television Chip gleefully bashes in a few walls, finds one problem with a no more than $3000 solution and from then on it is smooth sailing to Joanna’s staged finale. In reality, demo is a really big, dirty job that uncovers issue after issue. 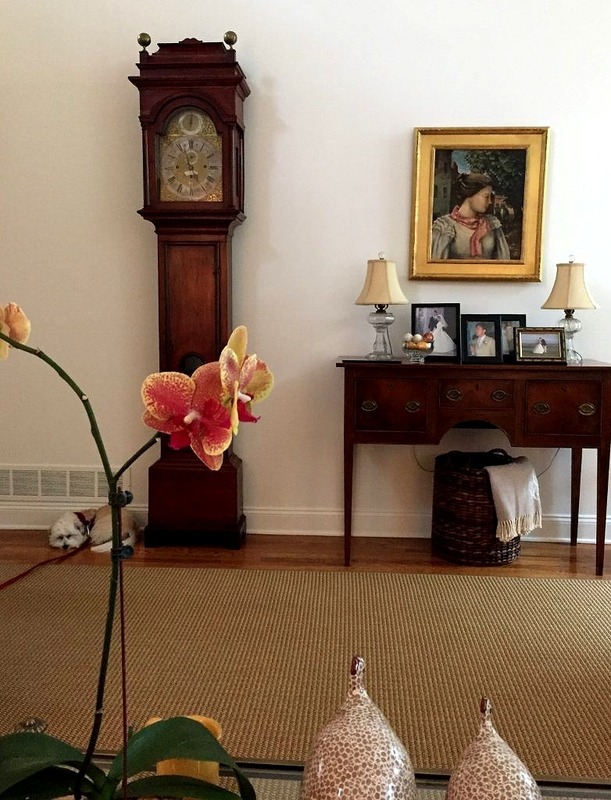 The list is endless in an older home and no matter how prepared you think you are there is always something else to contend with. The good news is under the carpet upstairs we found the original wood floors largely intact. And it looks like we can save the windows. 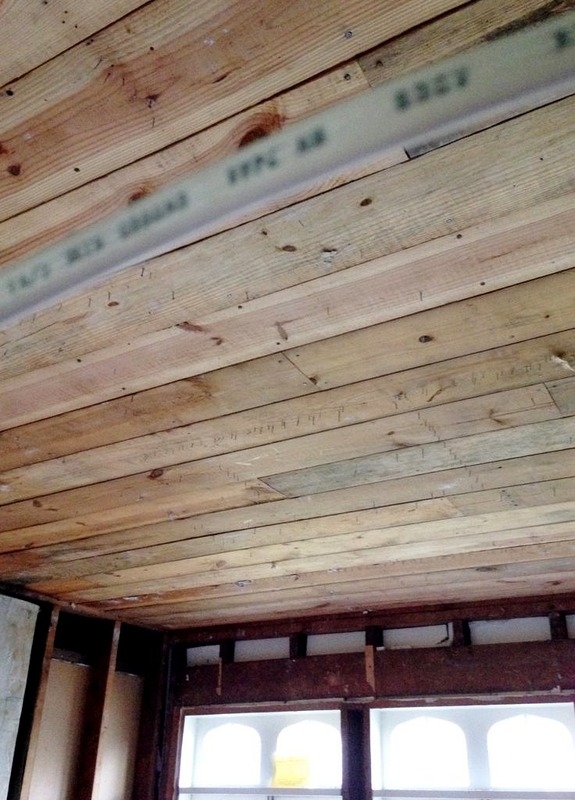 Then we found what I call shiplap and Keith calls 1 x 6’s on the ceiling in the dining room that I would like to not only keep but extend to the kitchen–seeing as the plan is to combine the two rooms. The next step is to have an architect, in this case, our friend and neighbor, Matt Cronin, draw up plans for the structural changes we are making–another step you rarely see on television but essential in real life. We are opening up the foyer, and the dining room to the kitchen (sadly the end to the little hobbit hallway but so much more functional for modern living). 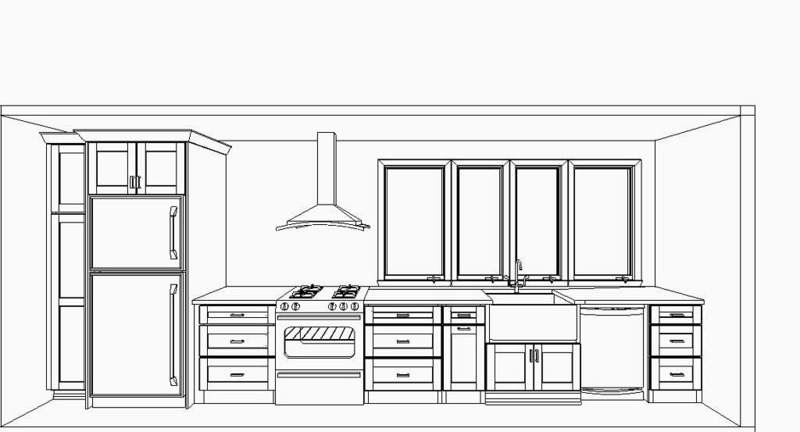 The good news is I get to plan and replan kitchen layouts and ponder all kinds of design elements. Granite or marble? Upper cabinets or open shelves? 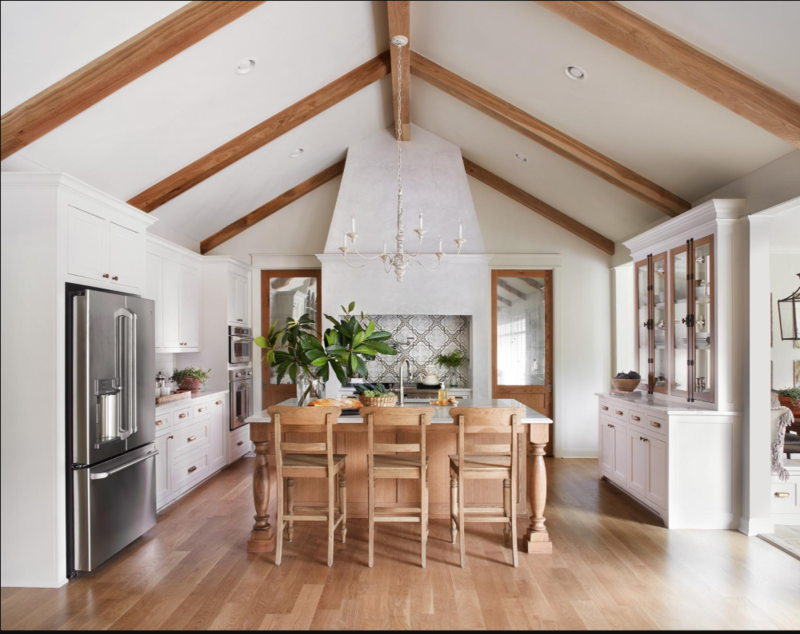 Tile floors or continue with the wood that is in the dining room? Below is my preliminary sketch. 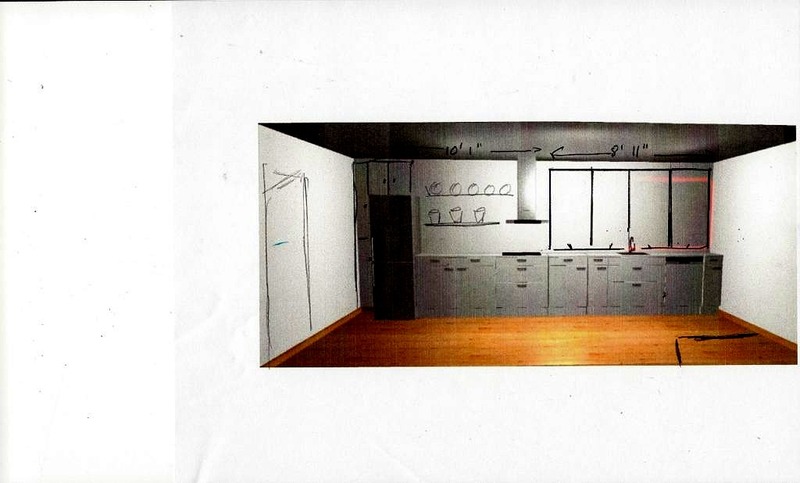 The kitchen is 19′ wide and just 10′ deep. 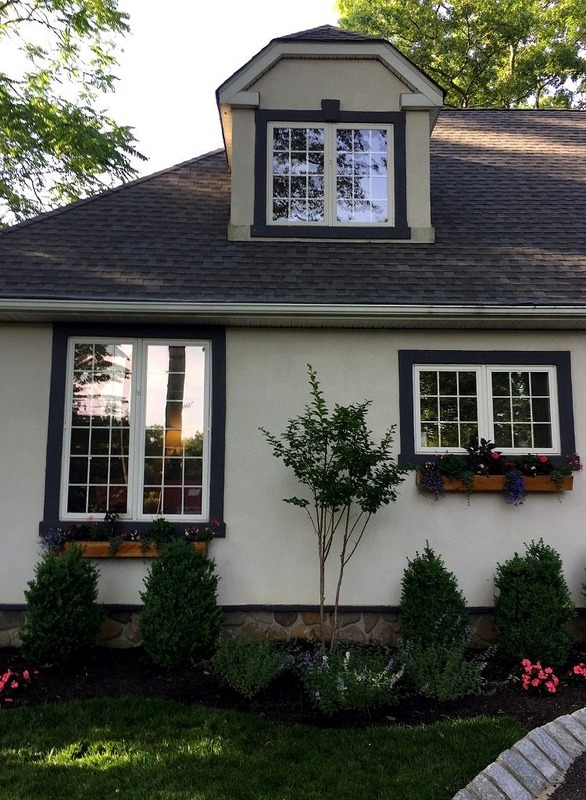 I’ll enlarge the existing windows so I can peer over my neighbor’s hedge to see the Navesink River and remove the ones looking right into my other neighbor’s kitchen windows. I’d like to put all the appliances on one wall–but that is so subject to change after I visit a number of local kitchen cabinet builders over the next week or so. Once my basic plan is finalized I’ll add a custom island for storage and seating that will come from the factory in Hungary that builds a lot of our furniture and if there is room, a hutch. Meanwhile, I’ve upped my cooking game. It’s the least I can do for the guy filling the dumpster. Nothing tastes better after a hard day’s work than a plate of pasta with tomato sauce and I think adding lamb takes it to another level. Fortunately, Keith agrees. Sprinkle with salt and pepper then sear 8 shoulder blade lamb chops in hot olive oil in a large sauce pot. Then chop up one 1/4 inch thick slice of pancetta and toss that in the pot. Add an onion coarsely chopped, a couple of cloves of garlic, a pinch of oregano, 1/2 can of tomato paste and two cans of whole tomatoes that you squish into bits. Let simmer until meat falls off the bone (about 90 minutes). Take the meat off the bones, chop and return to the sauce. I like to serve this with fettuccine but any pasta works. Top with grated parmesan, add a tossed salad and a nice bottle of plonk and enjoy. 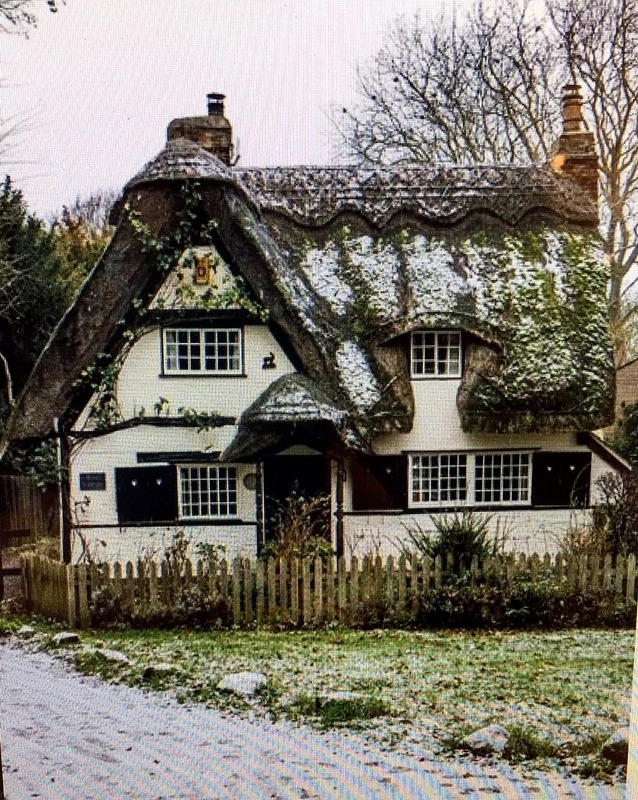 It was in the middle of our interminably long, hot summer when a customer told me I should buy the cutest cottage she had ever seen. 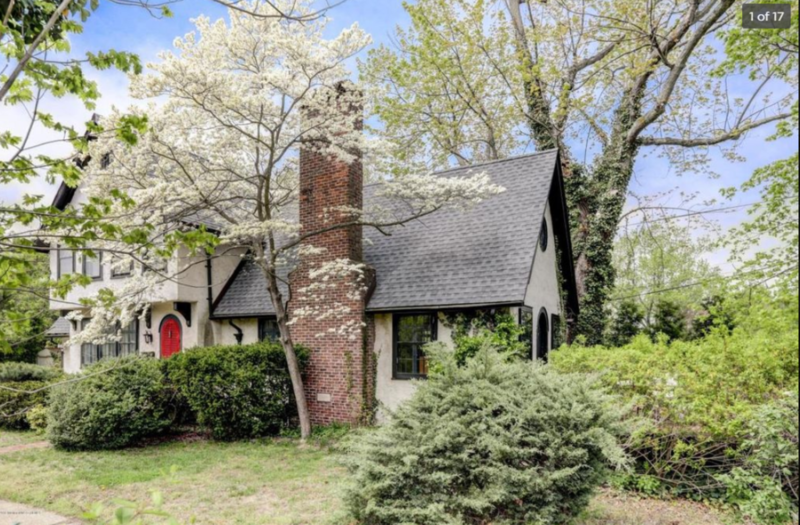 Located in the heart of the Fair Haven historic district, and priced well under a million dollars which these days she said, in red hot Fair Haven, made it a steal. Not really, but still closer to my price range if I was looking for a house–which I was not. But I couldn’t resist peeking at the listing the second she left, and this is what I saw. Oh man. How cute is this? 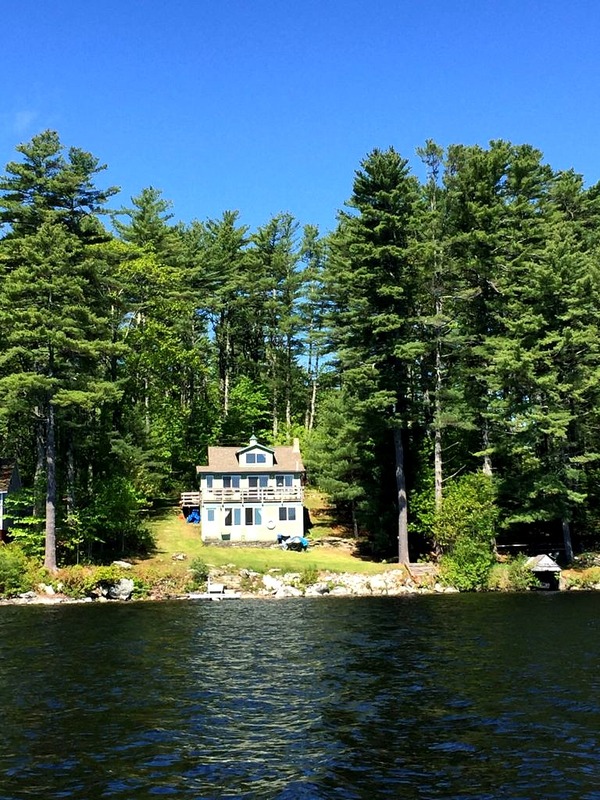 I took the bait and called my realtor, who also happens to be my aunt (Keith’s mom’s sister) and manager of Heritage House Realtors in Shrewsbury, just to take a look. A real estate all star, professional facilitator, and all around wiz, Christine had us in the house that afternoon. 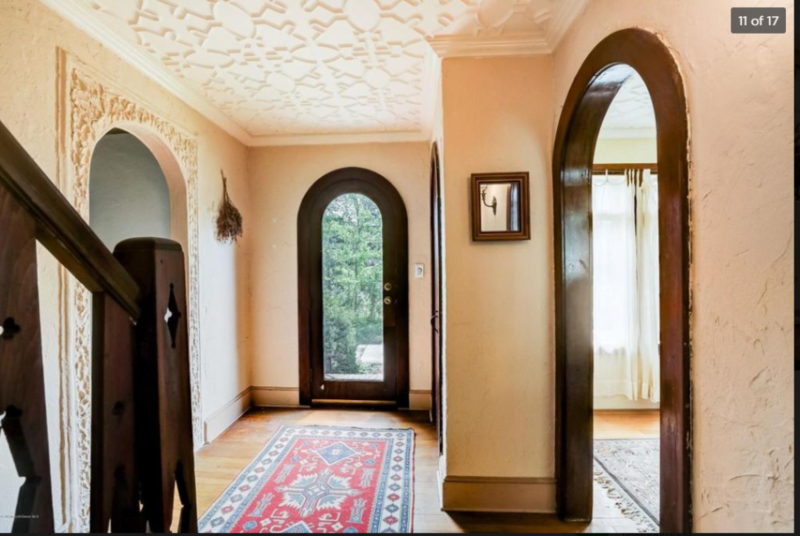 First thing you see is the adorable foyer, which is entrancing with all of its rounded hobbit doors and fretwork ceiling. (Which proved to be plastic, not plaster, and is coming down but I’ll save that for another chapter–the one about when the rose-colored glasses come off). The best was when I glanced through the door on my right. I was sold. 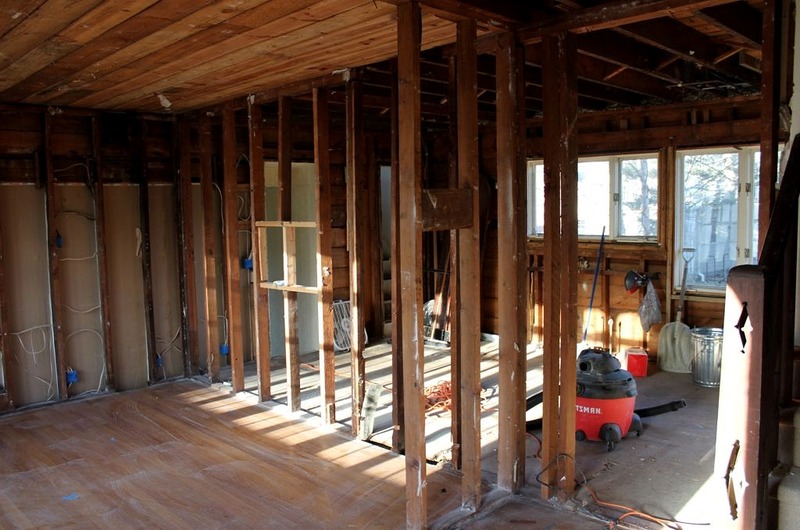 Forget that the rest of the house was a disaster: the basement indescribable, the filthy kitchen last updated in 1957, and the spartan one and a half baths not long after that. All I could think was how cool this room looks. To be honest Keith was, and is underwhelmed, but in the end, after a bit of hard bargaining and some unhappy inspection results we were able to purchase the property for substantially less than the asking price. Now the trick will be to turn all the negatives into positives–with a rather tight budget and a partner who is not convinced this is my best idea ever. I’ll let you know how it goes on this blog, which in the spirit of that dynamic duo from Waco, we will dub the “Fair Haven Fixer Upper”. Wish us luck. 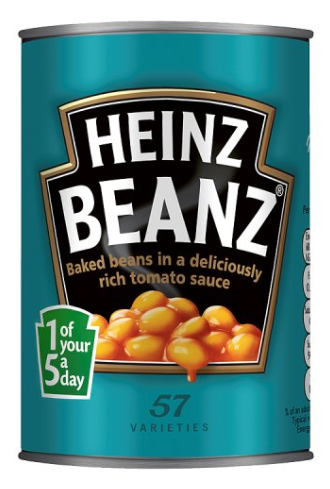 In a saucepan, heat up the beans. * Keith buys these at Sickles Market in Little Silver. Sadly not available everywhere. Homing refers to an animal’s ability to return to a place after traveling far away from it. While I know Keith loves living in the United States (he’s been here over 40 years for heaven’s sakes!) there will always be an England in his heart. 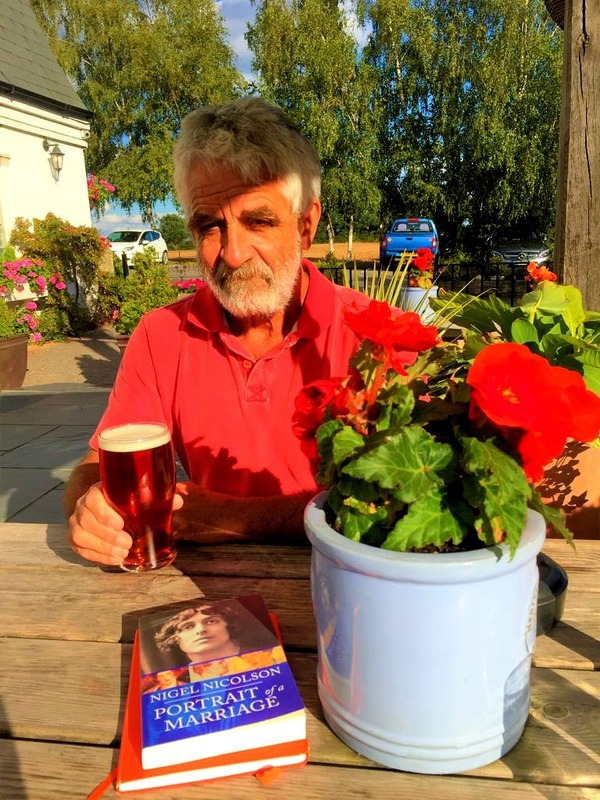 So it was brilliant to pop over the pond and soak up some real ale, visit with the relatives, and just be in that special British kind of groove for a couple of weeks this fall. First stop was in Surrey where we met up with Keith’s Auntie Pat. 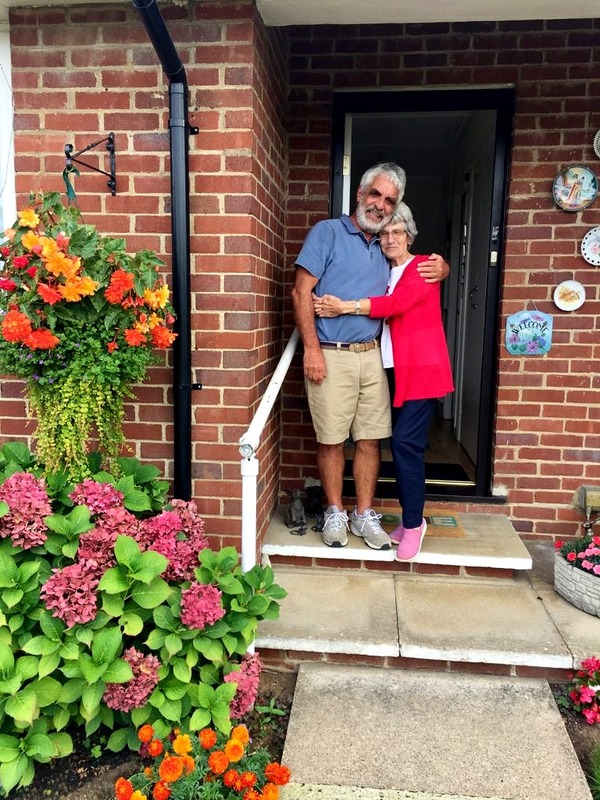 No proper English home is without a garden and Pat always has one of the best. 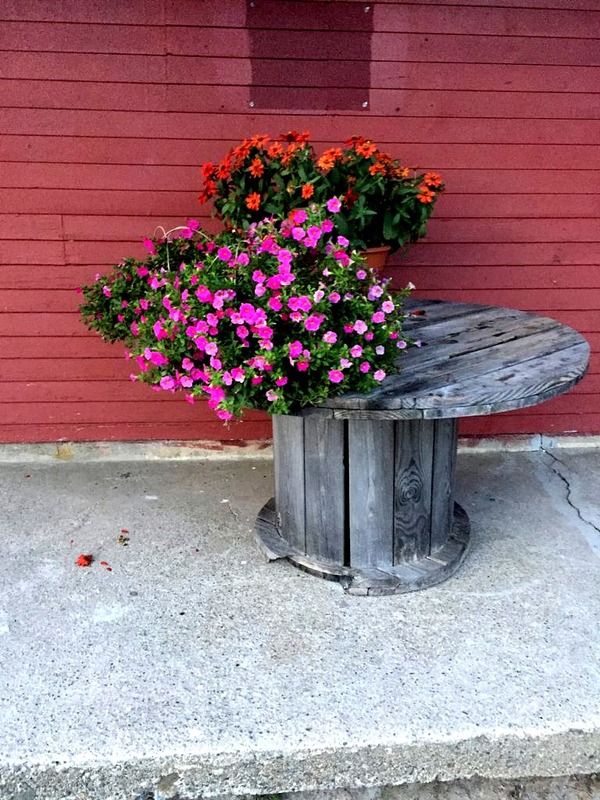 Love her hanging basket and bold use of color, so warm and welcoming. 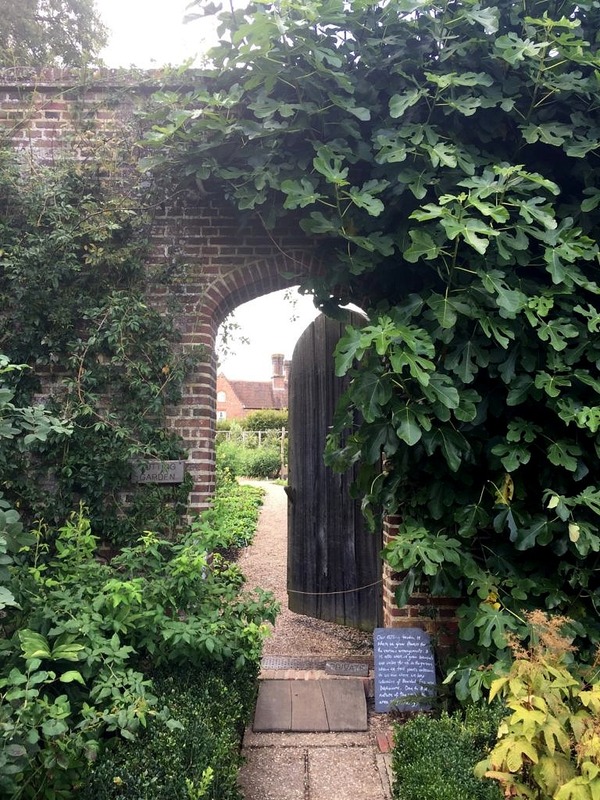 Next stop was arguably one of the most famous gardens in the United Kingdom: Sissinghurst, in nearby Kent. 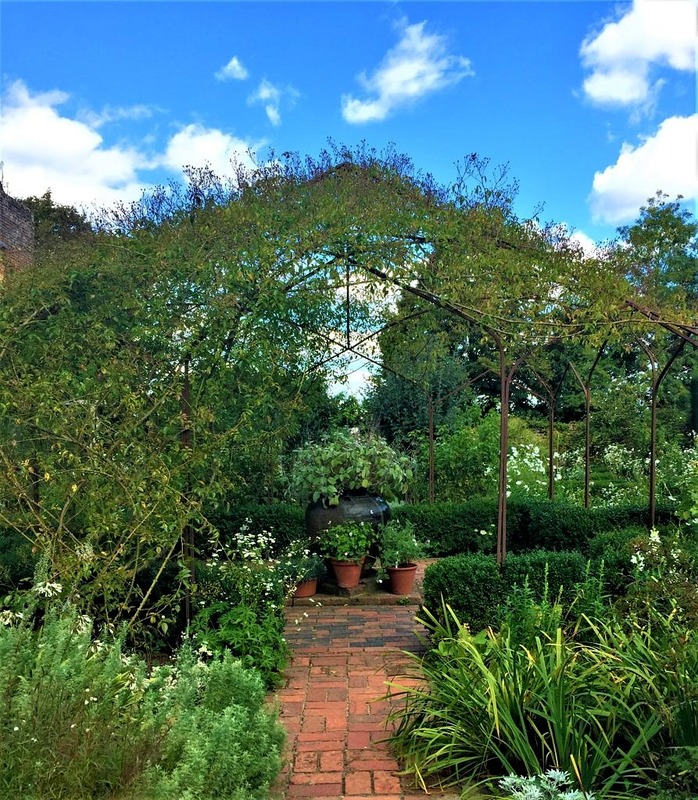 Originally owned by Vita Sackville-West and Harold Nicolson and now the National Trust, it is a must stop for garden lovers and English lit majors the world over. 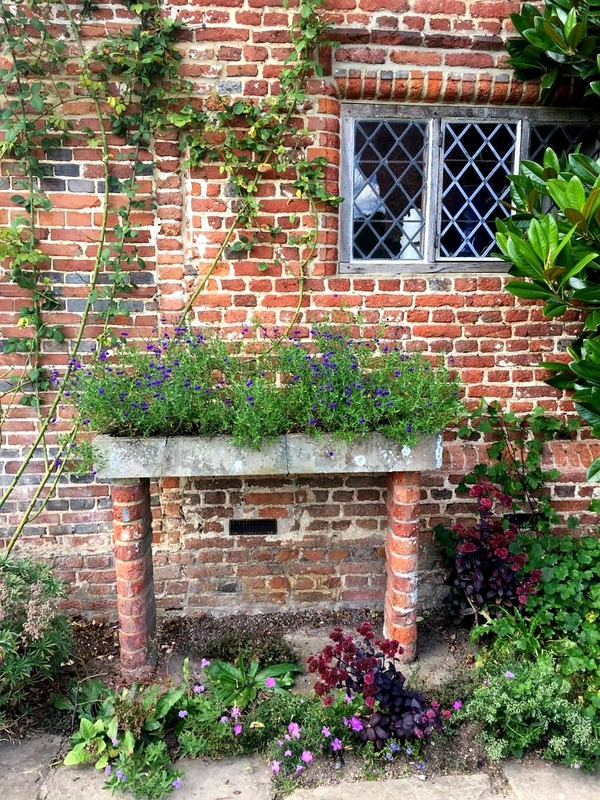 Vita was a Bloomsbury Group original, lover of Virginia Woolf, and gardener extraordinaire. 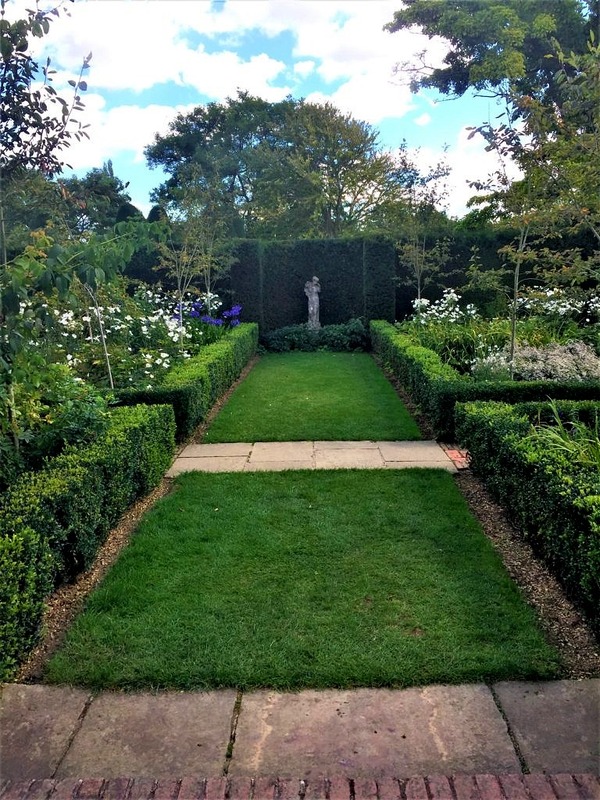 In her own words: “My liking for gardens to be lavish is an inherent part of my garden philosophy. I like generosity wherever I find it, whether in gardens or elsewhere. I hate to see things scrimp and scrubby. Even the smallest garden can be prodigal within its own limitations… Always exaggerate rather than stint. 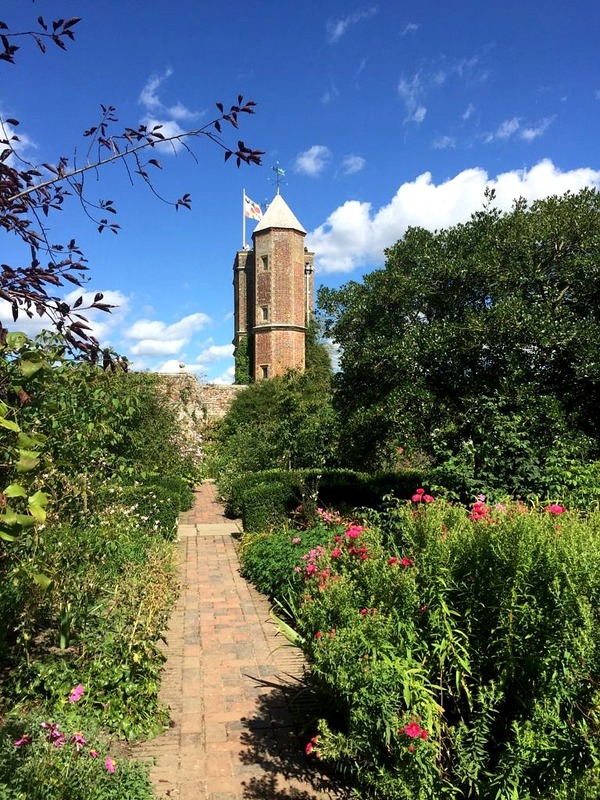 Masses are more effective than mingies.” Trust me there are no mingies at Sissinghurst! It wasn’t huge, as English gardens go, but with allees and walls and hedges and borders, vistas, large and small abound. And the totally famous White Garden, even in fall, was a masterpiece of design with a lush fullness and texture that belied its ostensible lack of color. Green is a color after all. There was not a corner left untended–or unplanted and every turn brought another awesome vignette. I probably took two hundred more photos; everywhere I looked there was a better shot. But, eventually cocktail hour approached and we were meeting a cousin at a fabulous pub and B & B in Tonbridge so it was time to get a move on. And time for a pint. 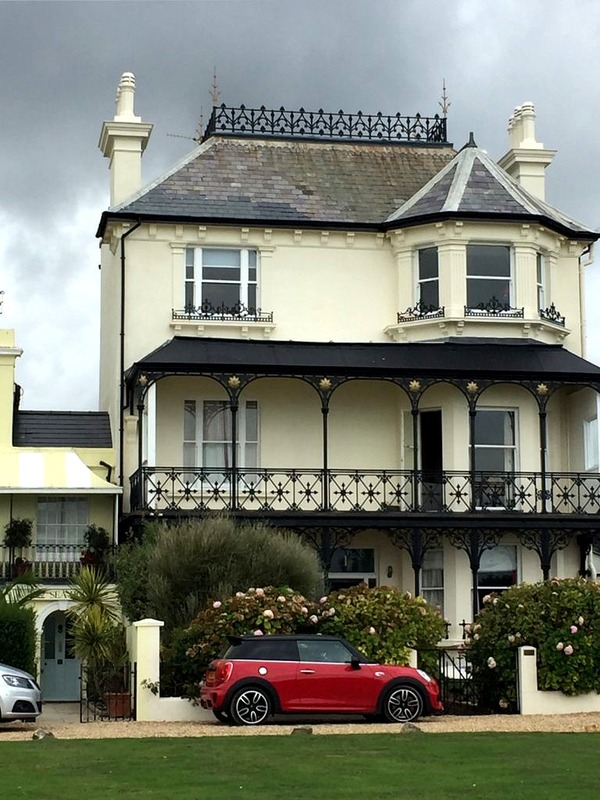 Next we headed to Bognor Regis, a classic and classy seaside resort made famous by King George the V, and our home for the next few days while we enjoyed our niece Chantal’s wedding festivities. 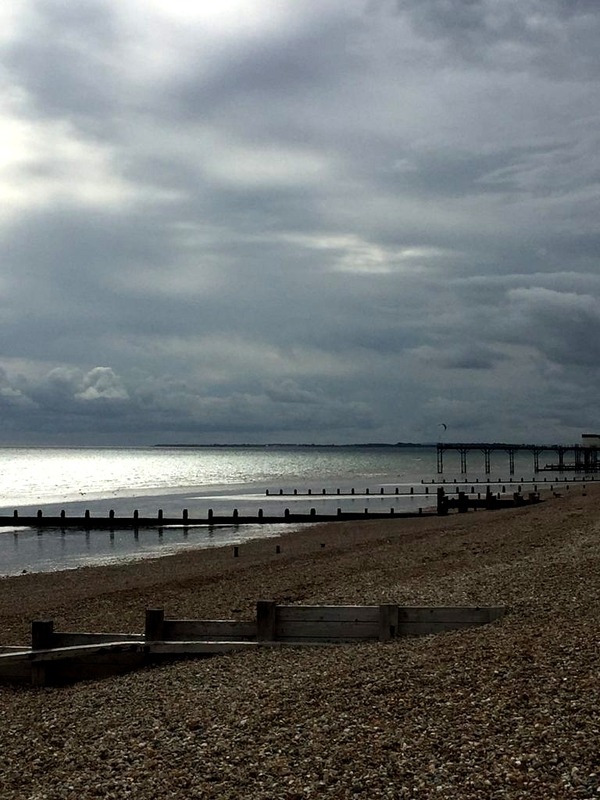 Between the seaside and the architecture Bognor Regis is a great place to stay so if you go to that part of the English coast give Brighton, the better known city just to the east, a miss–overcrowded and over-rated in my opinion–and stay in beautiful Bognor. 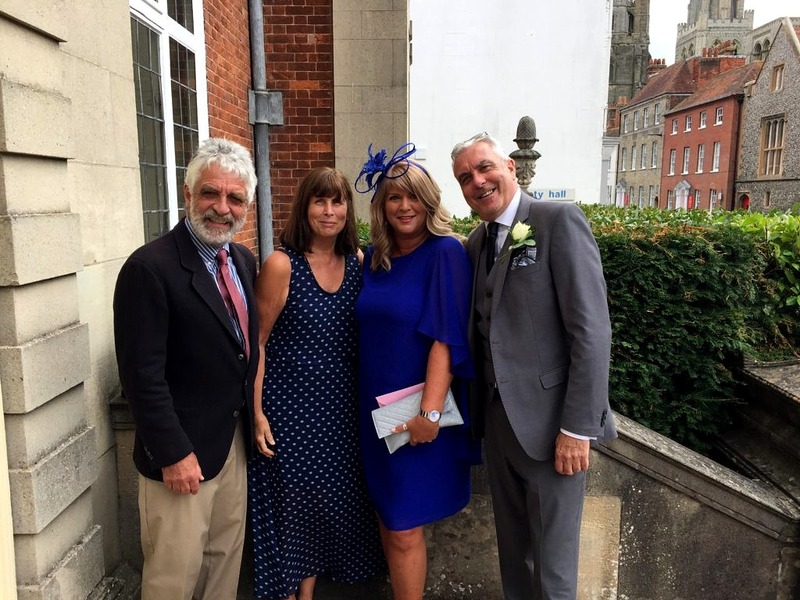 The wedding was a civil ceremony in the town hall in nearby Chichester. Here we are with Keith’s brother and his partner. (I decided against the fascinator; tempting as it was I felt it best to leave that look to the natives). The reception was a double decker bus ride away at the groom’s parents nursery and garden center just outside of town. 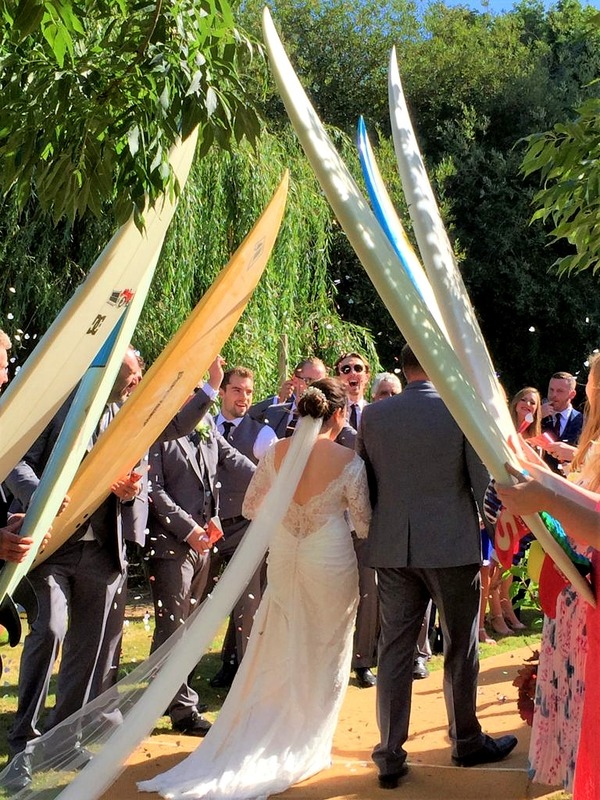 Sadly all good things must pass, even weddings with six surfboard salutes; it was time for us to get to work. 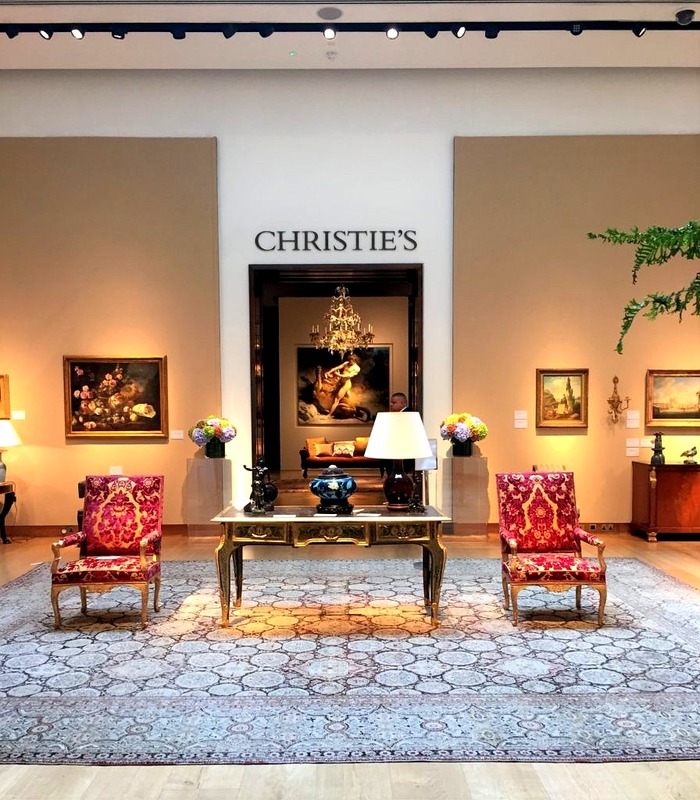 First stop, Christies Auction House in London to see how master U.S. designer Michael S. Smith curated that week’s sale. The brief was to show how antiques can be incorporated into everyday design–a no brainer except it seems for everyone under 40 these days. For probably around $10,000. 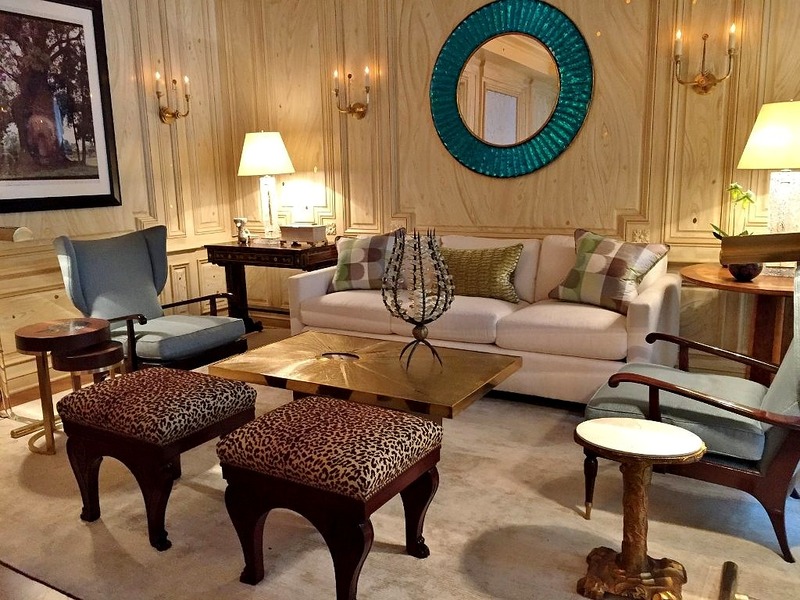 (if the auction estimates were to be believed) you could furnish a living room–and dining room! Granted they were not period antiques, but who cares? 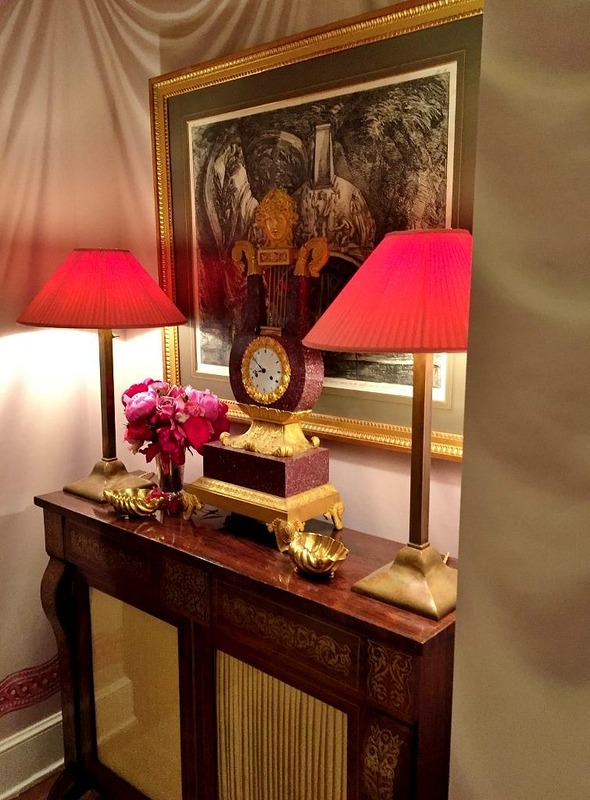 Everything in the salesroom, whether antique or merely vintage, was well made, decorative and well worth the cost. We would have and probably should have and may well do in the future. The other designer setting up the exhibition was Martin Brudnizki and his styling was to die for. Check this out. 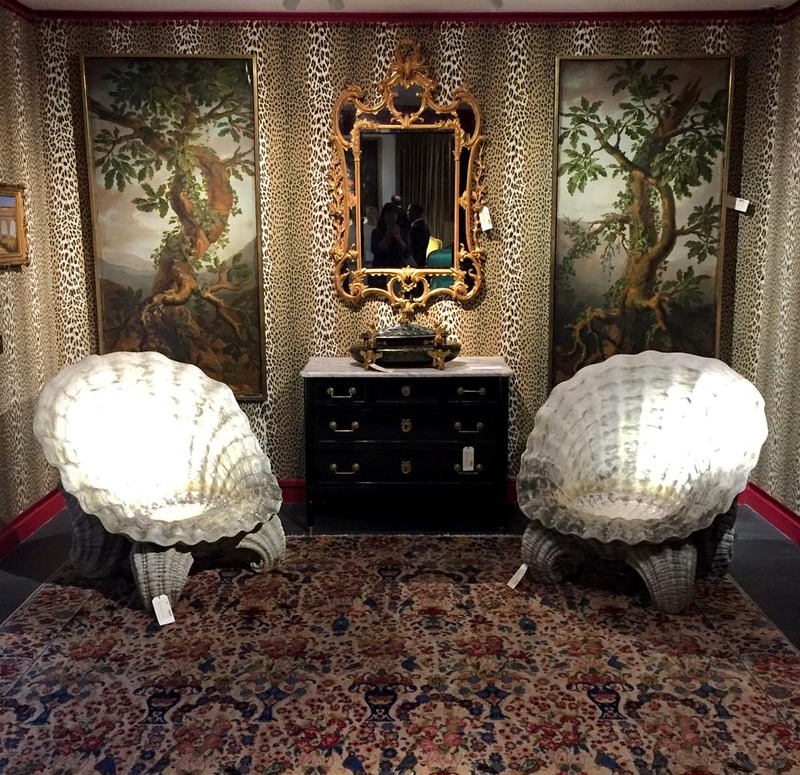 And this: There was just a mad assortment of things old and new and what a great treat to see how these two design Ninjas put this with that and altogether came up with a whole room you just wanted to take home. 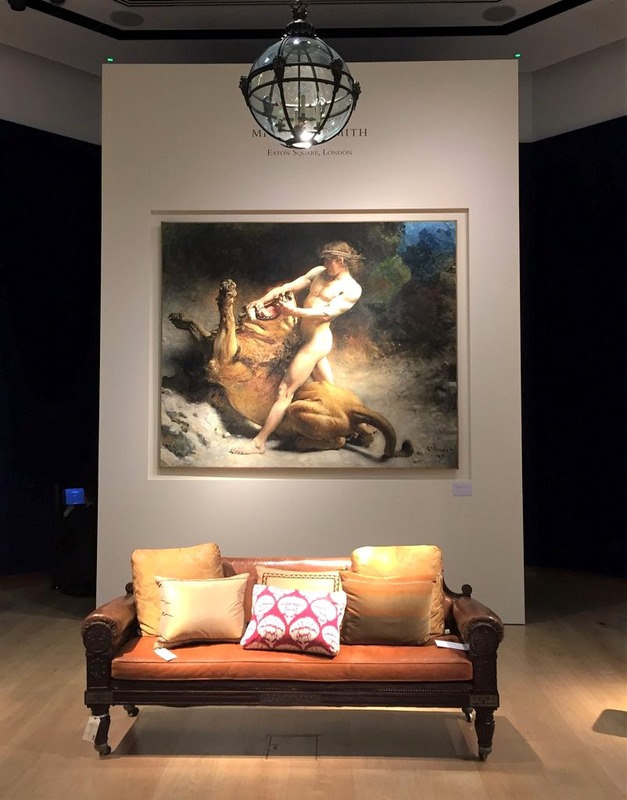 Kudos to Christie’s for coming up with the idea to show objects in situ. Our next foray was to Kings Road. 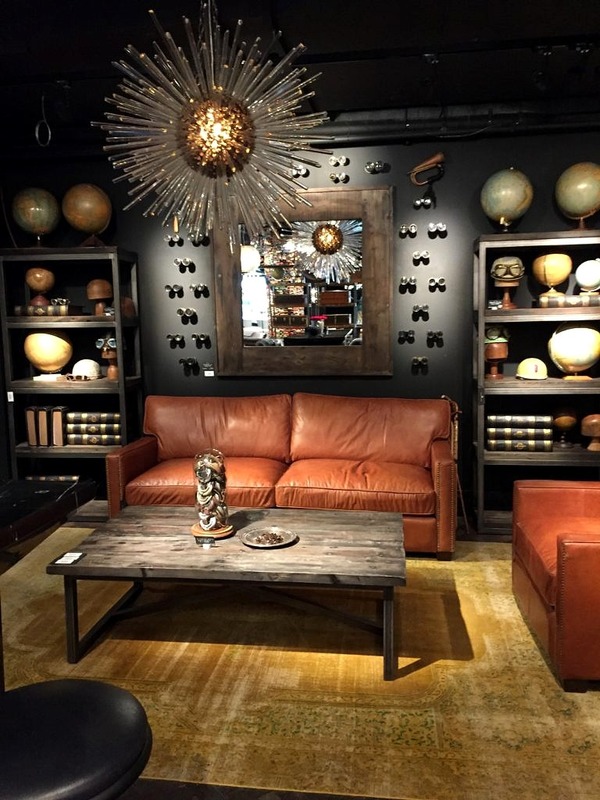 Home to iconic shop after iconic shop, it is a little bit of heaven for anyone with a penchant for interior design. Osborne and Little were showing Nina Campbell’s new line. 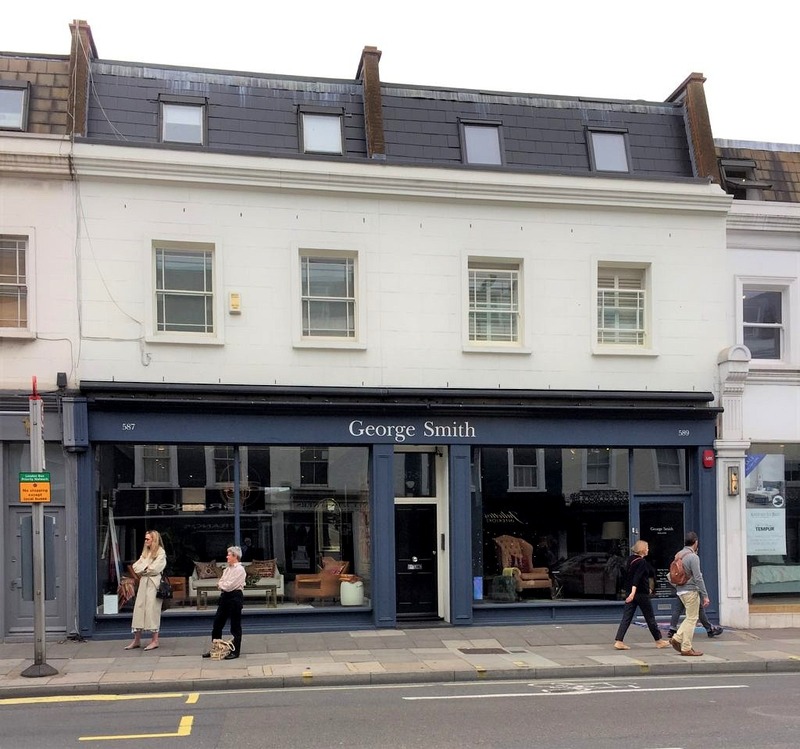 The latest from George Smith was on display. 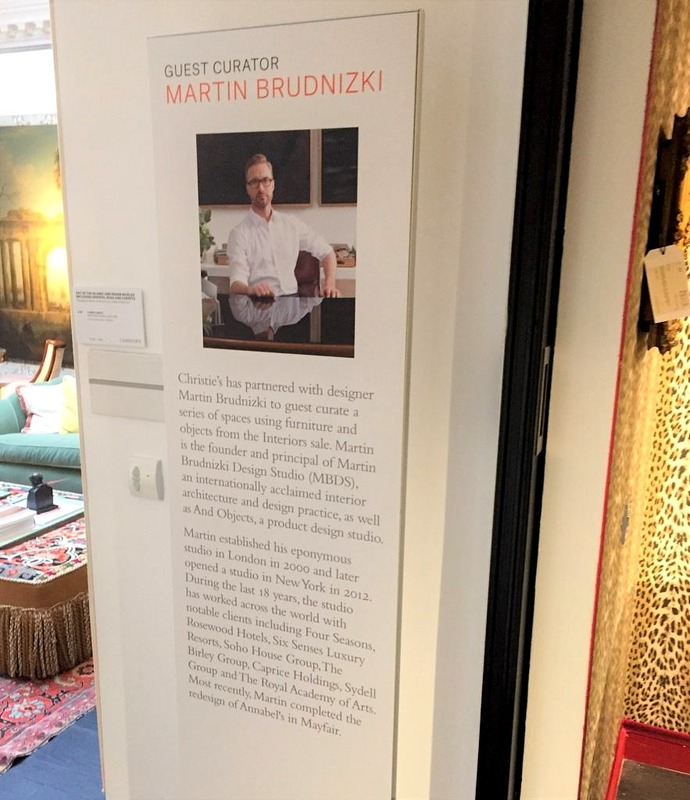 Timothy Oulton (familiar to Americans through his RH connection) had just opened a new store called Bluebird. And clearly was channeling Michael S. Smith’s Christies vibe. 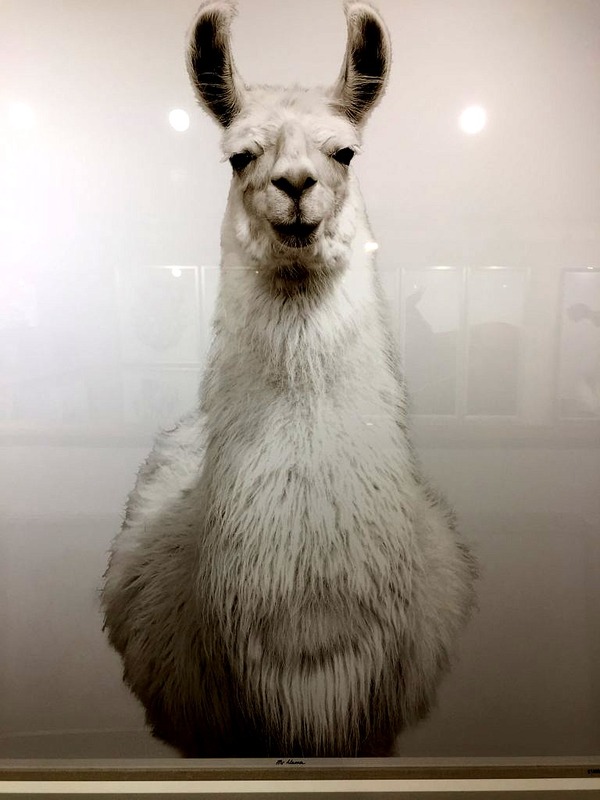 Then we spent a long time at Trowbridge Galleries, the leading purveyors of art photography in England, and a vendor we are considering for the store. Next stop was the London Design Centre,Chelsea Harbour . They were madly putting the finishing touches on many of the showrooms in preparation for the London Design Week. 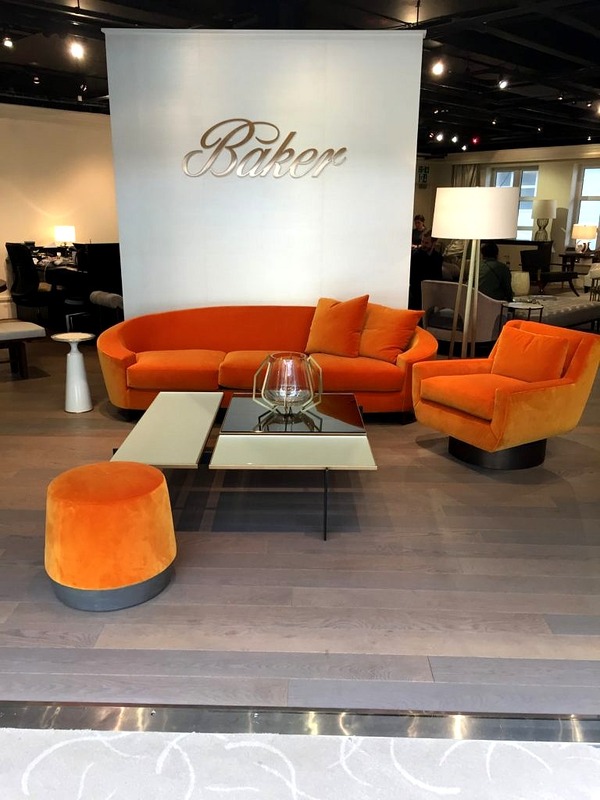 Loved the color of these sofas; clearly you can’t go wrong with pumpkin this fall. 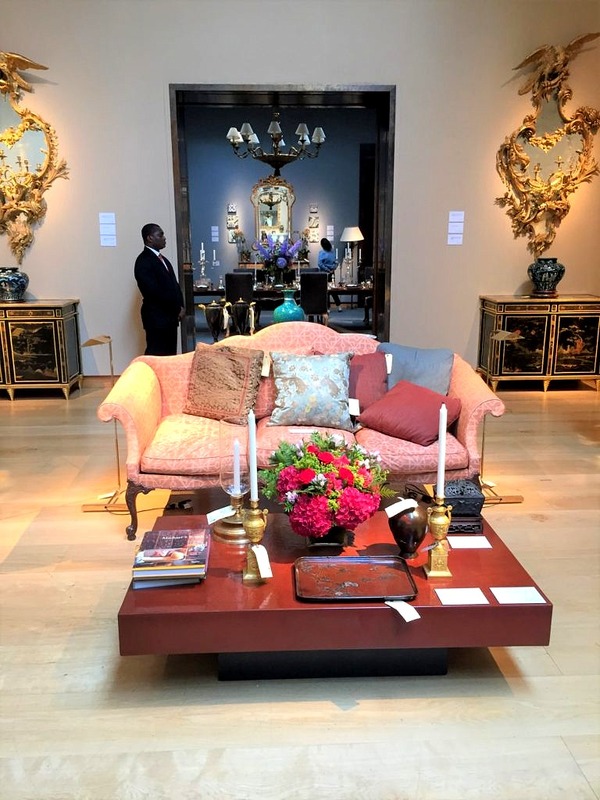 It was a great way to wind up our trip and a fabulous opportunity to see the latest in home decor from a whole slew of world-class designers and renowned retailers. But eventually all good things must end; it was time for us to go home. But I couldn’t stop thinking about the meal we had at Chantal’s wedding. 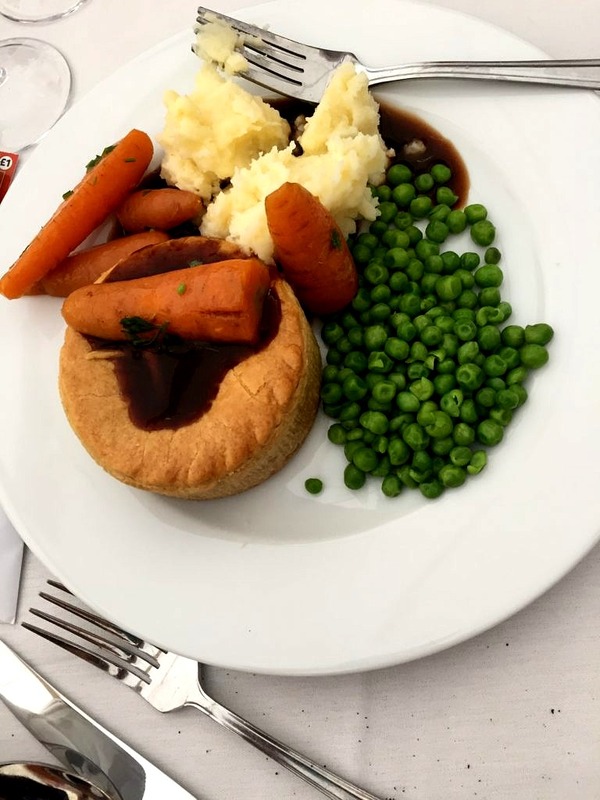 Everyone was served a meat pie and then gravy, mashed potatoes, peas and carrots were placed on the tables family style. I can’t believe I ate the whole thing! So I googled meat pies until I figured out how to do it. Here’s the Nelson Family version. 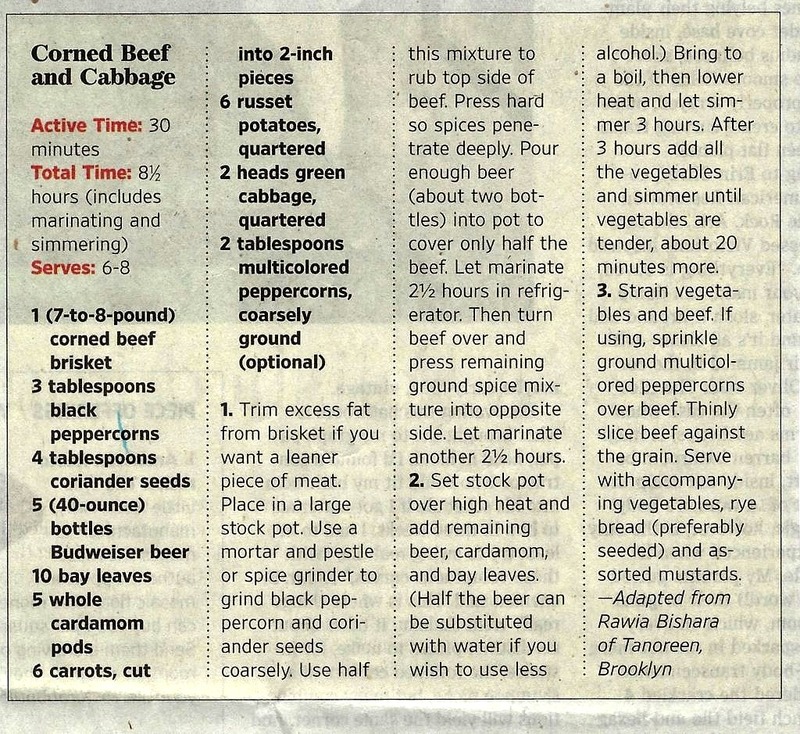 First make your favorite beef stew. I delegated this to Keith and he made a Beef Bourguignon, using his favorite recipe from The James Beard Cookbook. The first night we had this in classic stew form, the next night we made meat pies. All you need to do is buy some puff pastry–it comes in your freezer section and thaws in the microwave if you forget, like I did, to take it out of your own freezer. Using an inverted glass, cut circles out of the dough and place in greased cupcake tins. Fill with stew–a good trick I read and followed–is keep the filling on the dry side. Next top with a pastry lid, using a fork to press the dough around the edges to seal the pies shut. Cut two small slits in the top, and brush on some egg white. Cook in a pre-heated 390 degree for 30 minutes. Not bad for a first try–easy as pie! Keith was happy to have a taste of home and now you can too. 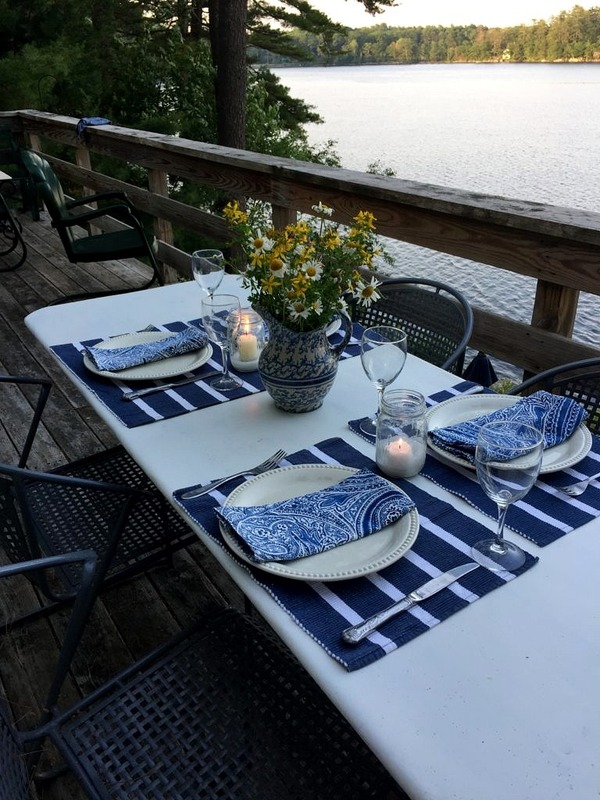 We barely had time to unpack the New Shipment of antiques and custom furniture from our factory in Hungary in late July, when it was time to whoosh up to our Maine cottage for the best two weeks of the summer. 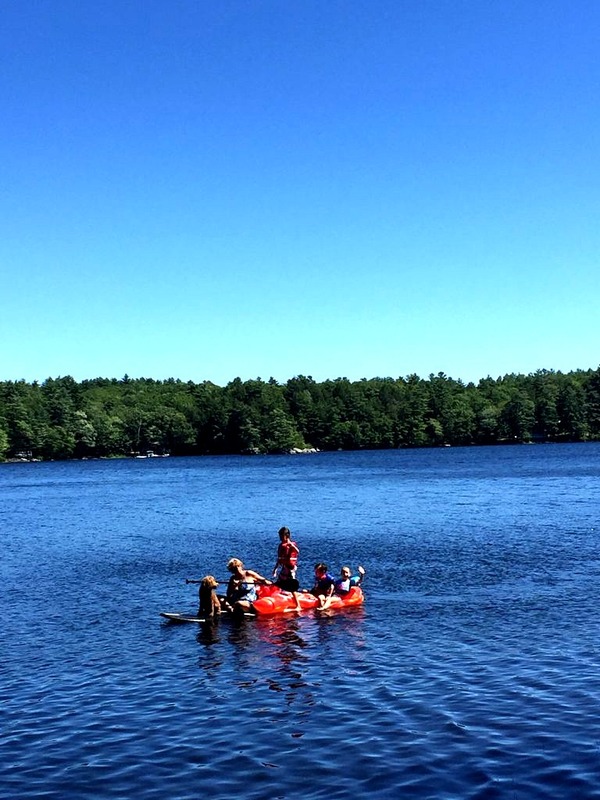 August promises so much: warm water temperatures, delightful breezes, bright skies, and the tastiest fresh food from the farmer’s market and the local lobster and fish co-op. 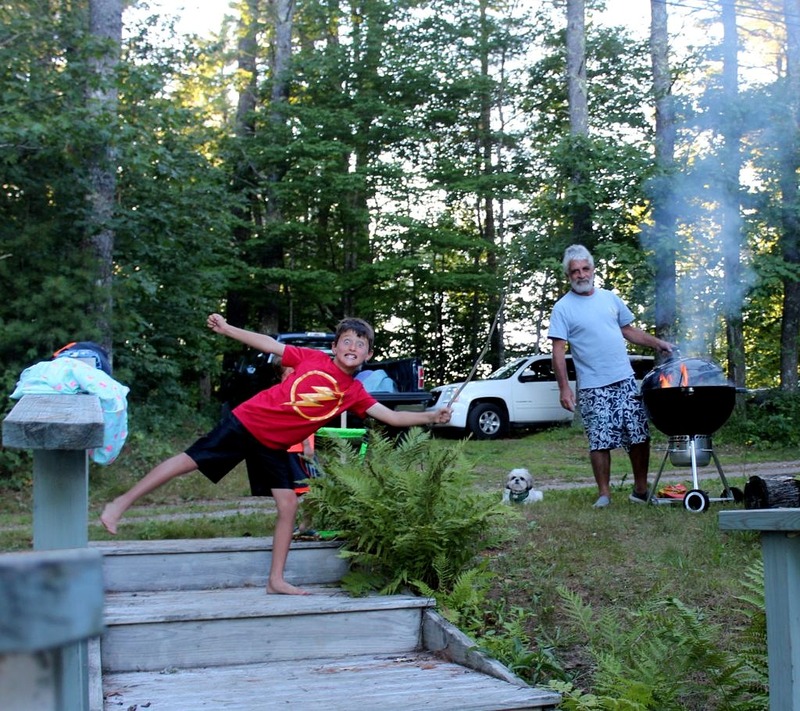 It’s the best time for family visits because the kids, and adults too, can be outside all day running around like lunatics and swimming like fishes–then sleeping like logs at night. At least we did. 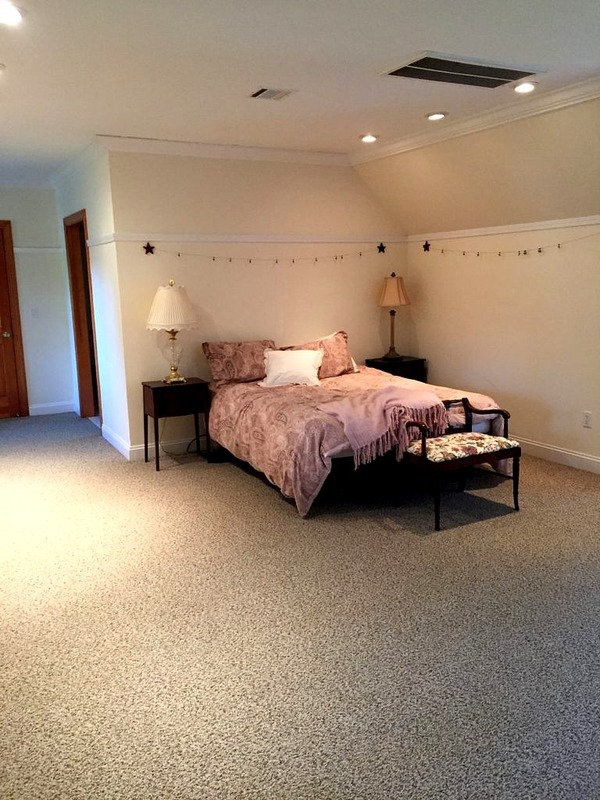 A long time ago a customer with a vacation home he inherited from his father told me his dad’s secret to successful hosting: Never give up your own bedroom. No matter what. 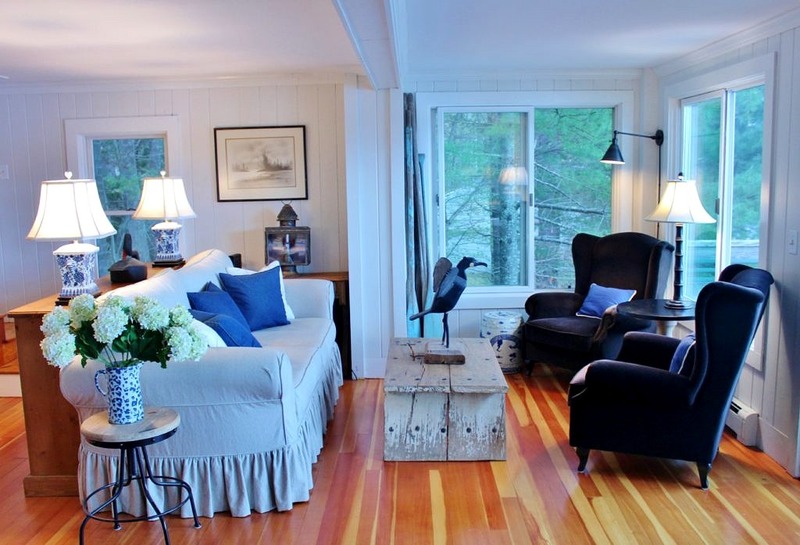 Ours is totally British Cottage Style, albeit with a bit of bling. 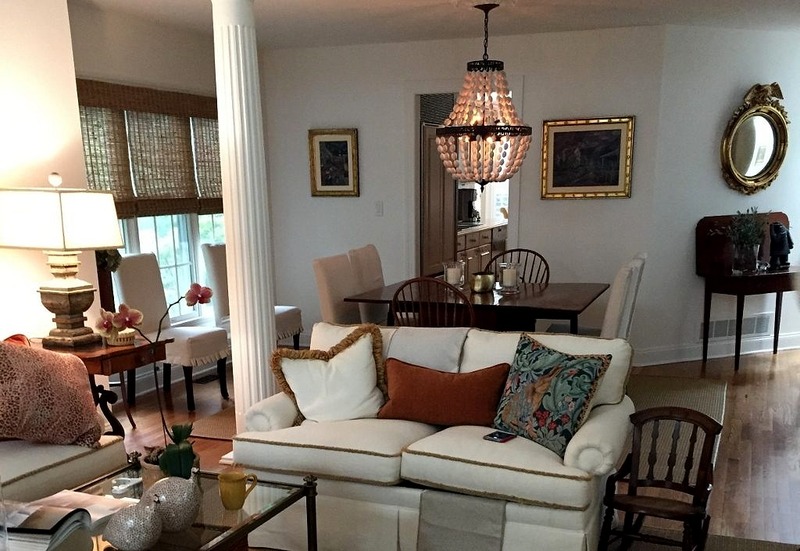 The chandelier is an antique, and the sconces are from Currey and Company. 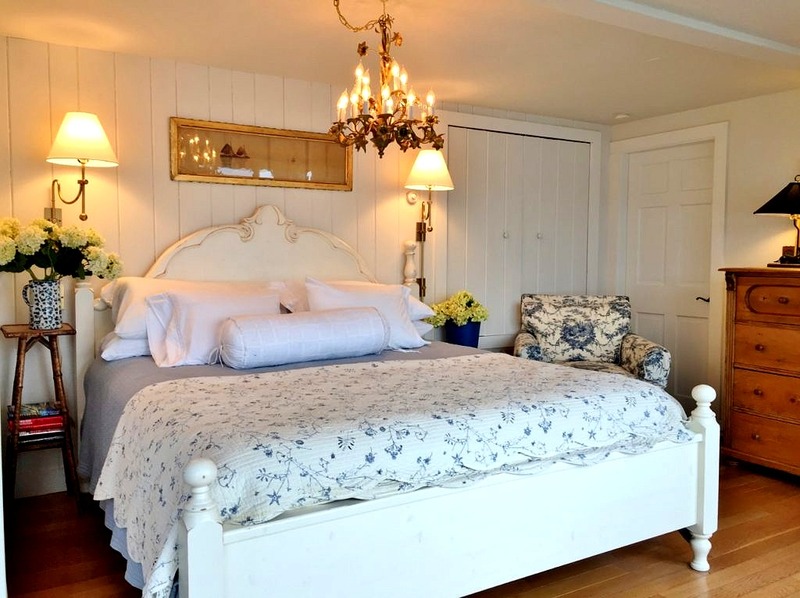 The vintage white king size bed is by British Cottage, leaving just enough room for one of the robust antique pine chests of drawers we import from Hungary. 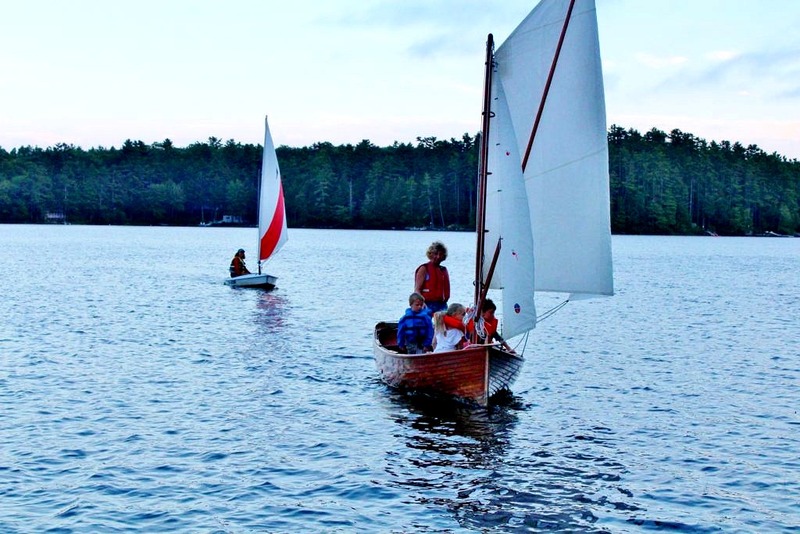 Comfortable, serene and a perfect refuge for when the going gets tough– or the young ‘uns get going! 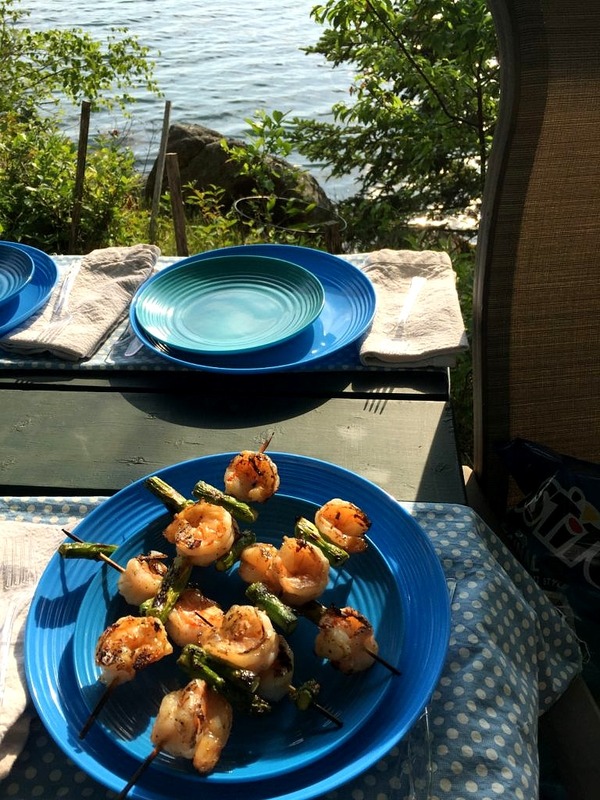 While some people believe a vacation means no cooking I think meals are much more fun to prepare when there is a crowd to enjoy them and help with all the prep–and clean up. Al fresco is always the best. 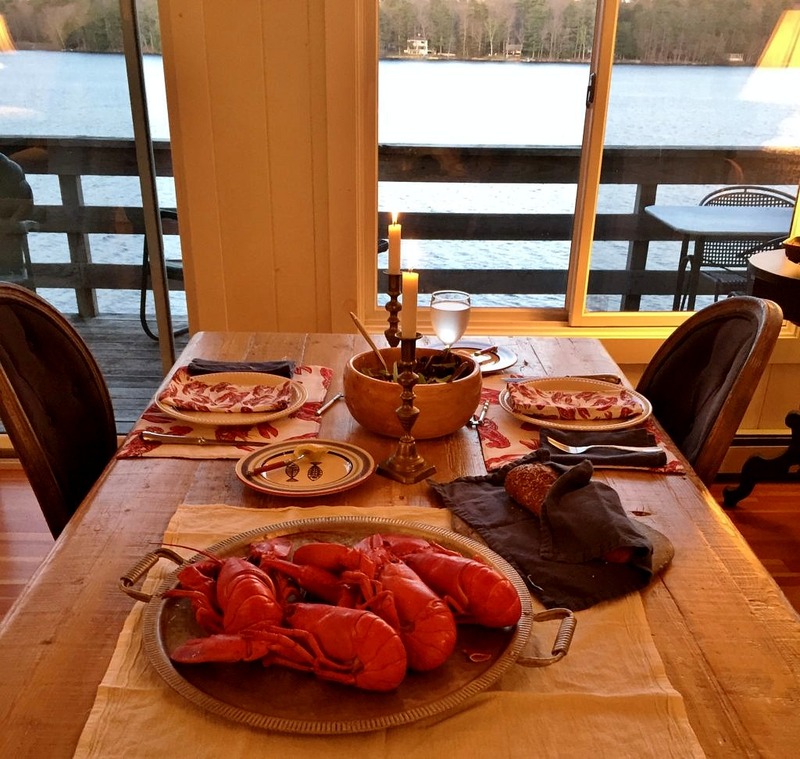 Lobster works anytime anywhere. 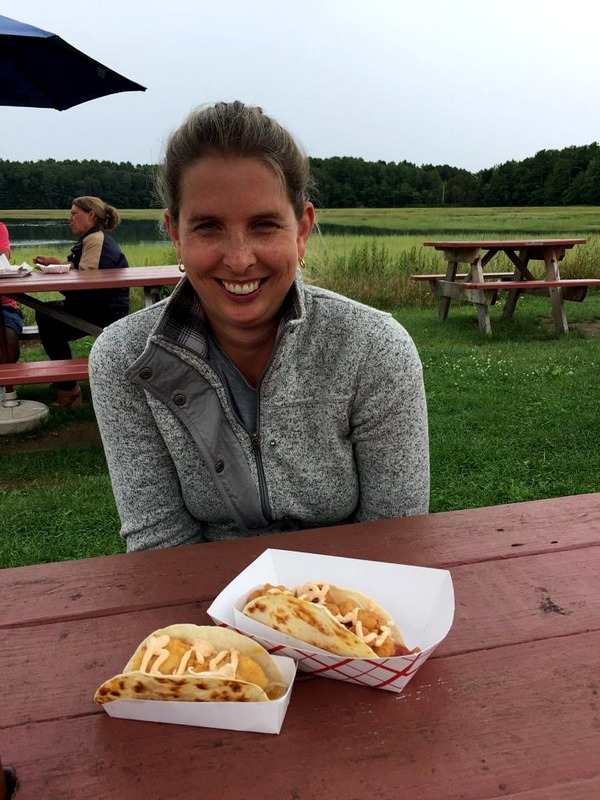 But the best dinner I had all month was from the August Bon Appetit and is a made for Maine summertime dish. 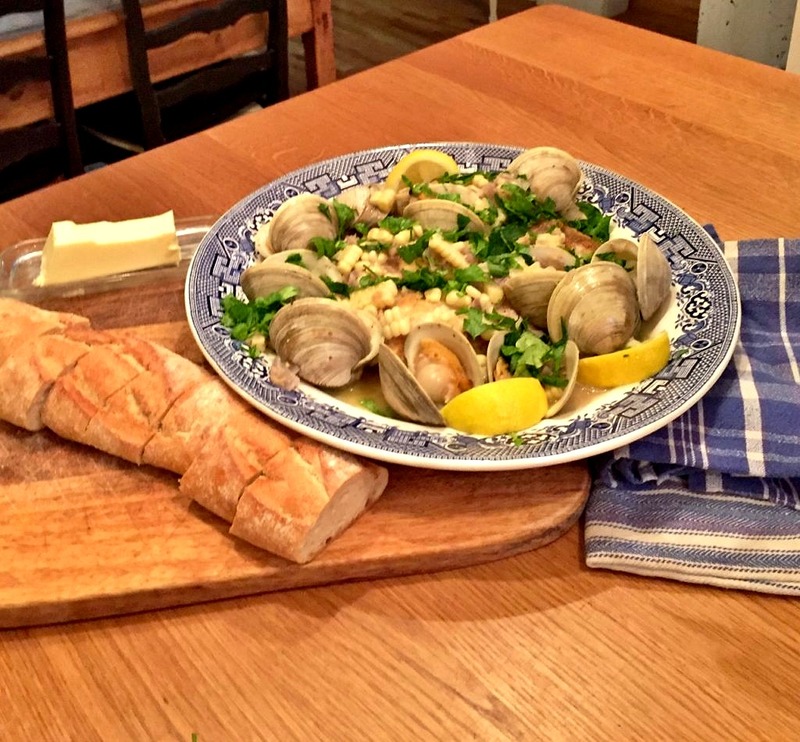 I love clams and almost never cook them but this recipe will change that. Just make sure to double up on the ingredients because everyone will want seconds! Season cod all over with salt and pepper. (You can skip this step; I find the clams are salty enough.) Sprinkle flour over a large plate and, working one at a time, press side of fillet where skin used to be into flour to thoroughly coat. (Coating the cod with flour before cooking prevents the flaky fillets from tearing; any bits left in the pan will give body to the clam mixture.) Tap off excess and set on a platter, flour side up. Heat 2 Tbsp. oil in a large nonstick skillet with a tight-fitting lid over medium. Cook cod, floured side down, shaking skillet occasionally to prevent sticking, until flesh is opaque and starting to flake around the sides and underside is golden brown, 5–7 minutes. Carefully turn cod over and reduce heat to low. Cook until cooked all the way through (flesh should be completely opaque), about 2 minutes (thinner pieces may go more quickly). Place on a platter, golden side up; take care not to break up the delicate fillets. Turn heat back up to medium, pour remaining 2 Tbsp. oil into the skillet, and cook shallot, stirring often, until tender and golden, about 2 minutes. Add wine; cook until almost completely evaporated, about 1 minute. Add clams and cover skillet. Cook until clams open, about 5 minutes (some clams might take a few minutes longer). Uncover skillet and transfer clams, discarding any that didn’t open, to platter with cod. Reduce heat to low and add corn and butter to skillet. Cook, stirring until butter is melted, the sauce is thick and glossy, and corn is tender about 3 minutes. Spoon corn mixture over fish and clams. Top with parsley; squeeze lemon wedges over. The end. June swept by me and now July promises to do the same. However, right now I have a quiet moment so I can get to a few updates. 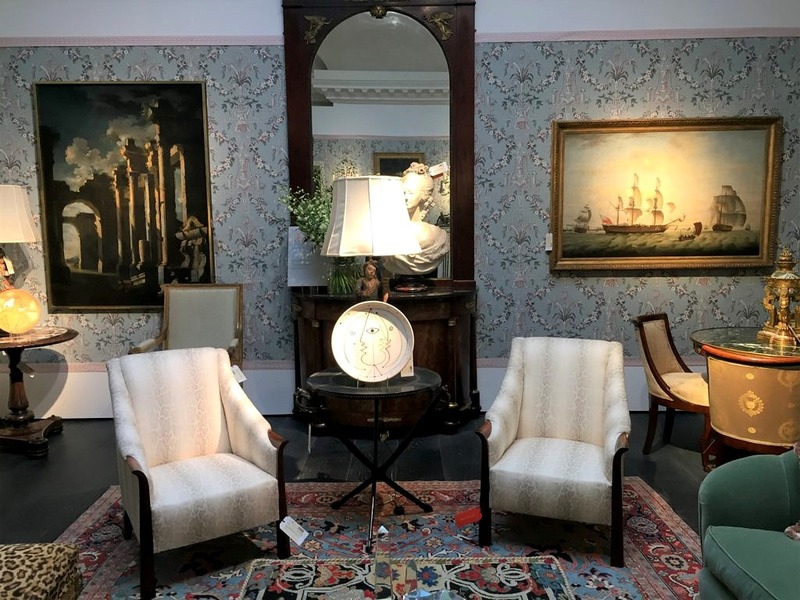 Let’s start at The Monmouth Museum – From June 1 to September 3 they have a timely exhibit for all of us home decor addicts. 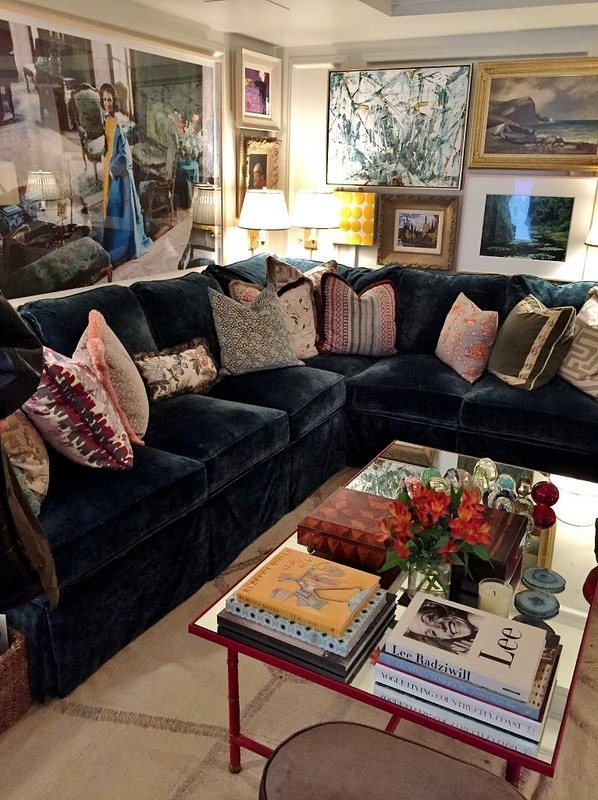 They are showing artwork with sofas and while the official stance is the art stands alone, the sofa is secondary, personally, I like it when it all matches. Here is what they paired with our British Cottage entry. Nice huh? Try to get there. The museum is in Lincroft on the Brookdale Community College Campus and there is a great children’s wing so maybe pop in on a rainy day. Keep your fingers crossed. 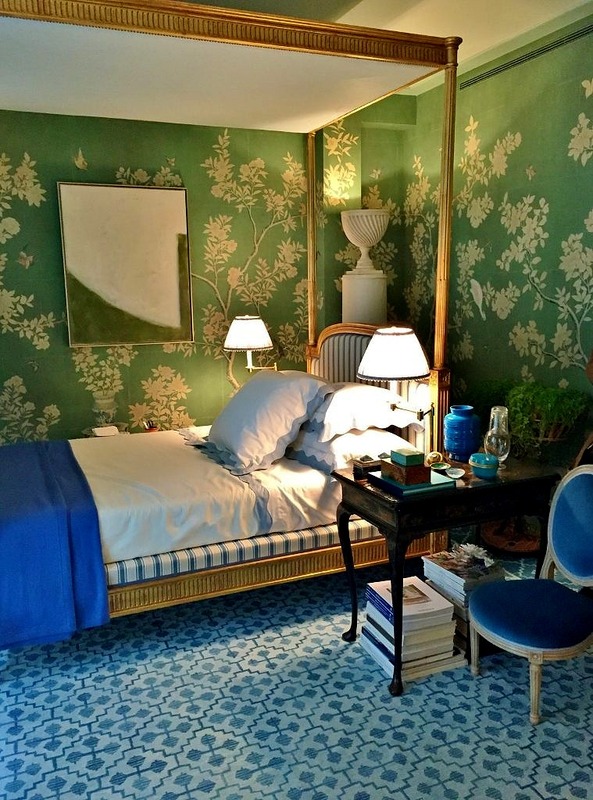 We’re counting on fabulous wallpaper from Thibaut and a to die for bed from Century to make this transformation a success. 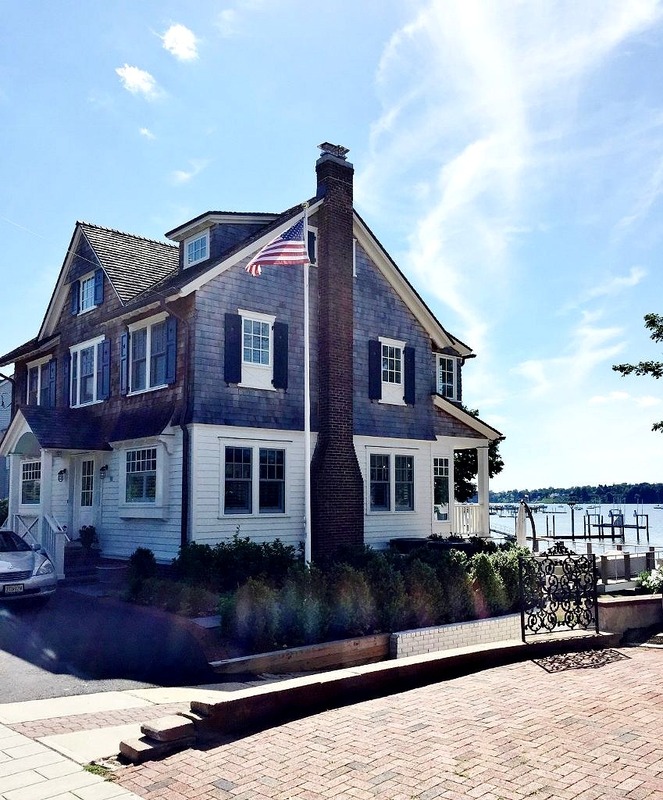 Meanwhile who wouldn’t welcome an excuse to hang out at this updated Shingle Style home in Fair Haven, literally steps away from the Navesink River, where almost empty nesters are creating a sophisticated coastal haven? Think the first-class berth on the QE2, no starfish and fishing nets here! While we are not designers, after thirty years of shifting furniture around we’ve developed pretty good eyes and are usually happy to weigh in if asked. At the store we marry the new with the old, casual with chic, and farmhouse with modern every single day so we are well aware of the challenges you face. 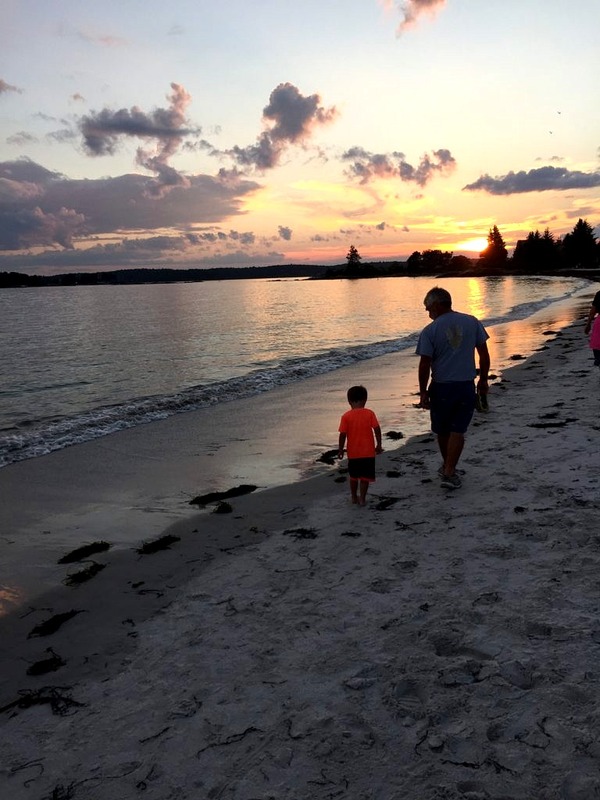 It is all about showing the things you love to their best advantage whether you are just starting out, or easing into retirement. Speaking of taking things you love and mixing them up; try doing that with green, red. orange and yellow peppers. Add some hot Italian sausage and you have a fabulous, fresh dinner that tastes like summer. The Wall Street Journal sometimes skews a little too right for my taste but their weekend features section is totally on the mark and my new recipe go to source. This is from their “Slow Food Fast” column. 1. Swirl 2 tablespoons olive oil into a heavy pot over medium heat. Add sausages, working in batches if necessary to avoid crowding, and cook until browned on all sides, about 4 minutes. Remove sausages from pot and set aside. 2. To the same pot, add peppers, onions and garlic. Sauté until vegetables soften, about 15 minutes. Stir in tomatoes, remaining oil and vinegar. Return sausages to pot and turn gently to coat. Braise until tomatoes reduce to a sauce that cloaks peppers, about 10 minutes, adding splashes of water if pot looks dry. Serve with crusty bread. 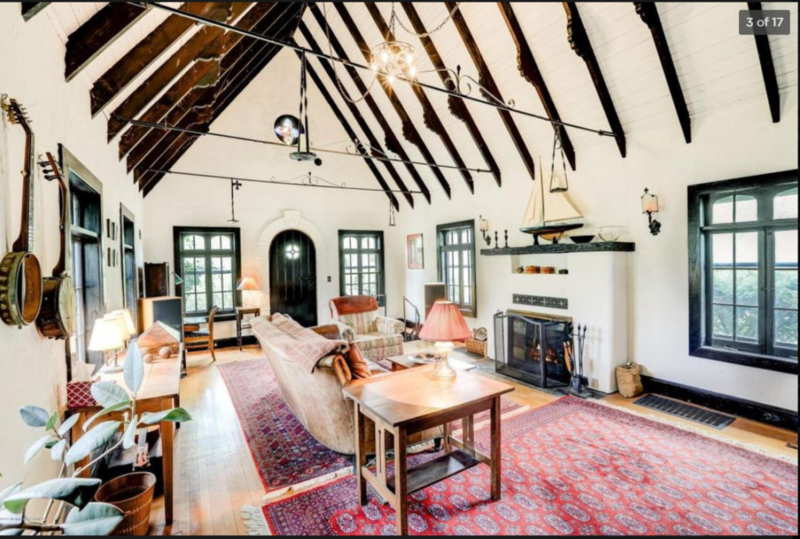 For a while I’ve been off showhouses not being a huge fan of modern, slick interiors in garish colors, or the reverse, all grey minimalism. 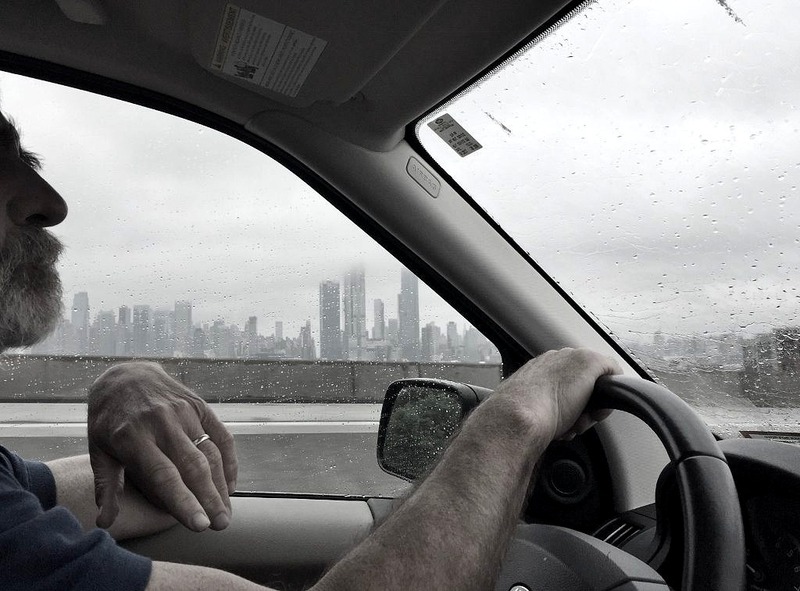 But this year’s Kips Bay Showhouse had three of my favorite interior designers: Mark Sikes, Alexa Hampton and Bunny Williams / Elizabeth Swartz on deck…so Keith and I motored into the city on a particularly bleak Sunday in late May. 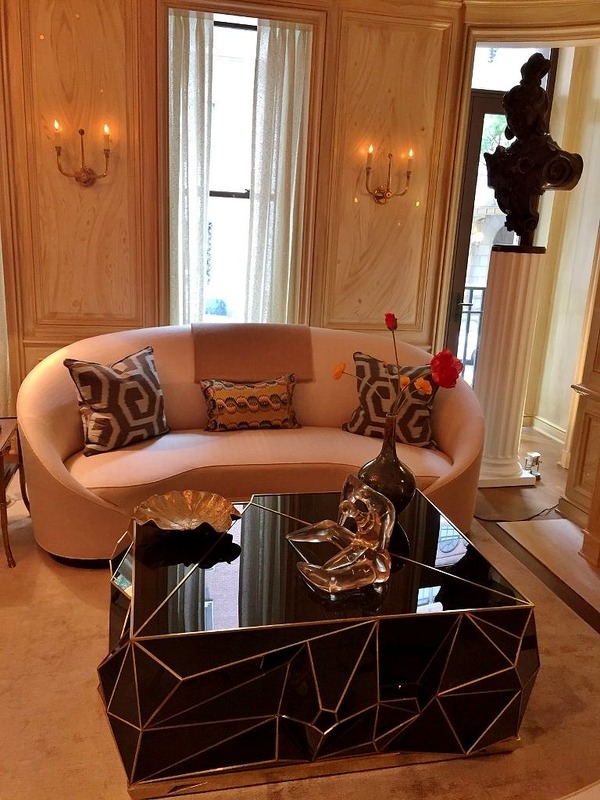 Located on East 76th street between Park and Lex in a 51 million dollar townhouse that is the largest on the NYC market today (read all about it here: (Upper Eastside Mansion for Sale), this showhouse had seven floors and countless rooms featuring the talents of the creme de la creme in home decor today. So for your forty dollars you basically got a master’s class in design–not bad. 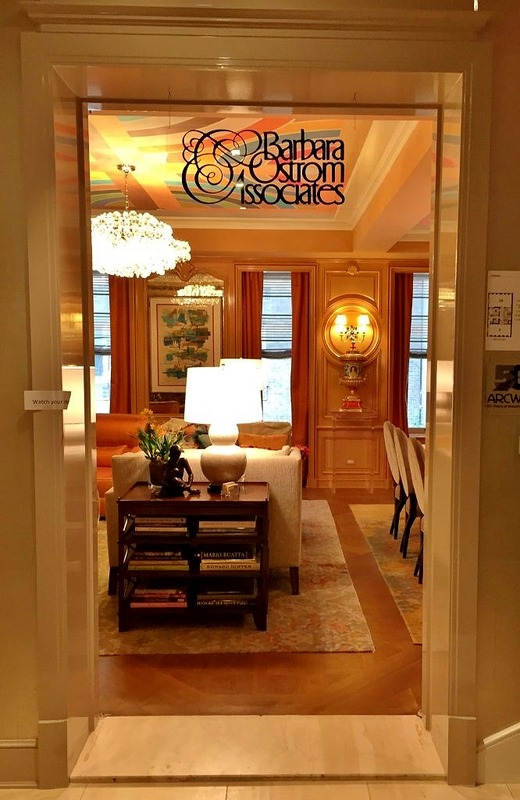 We started in the foyer–you could have sworn you were in Paris–then stepped into a spacious elevator that zipped us to the top floor which was entirely dedicated to an in-home spa space. Crazy. 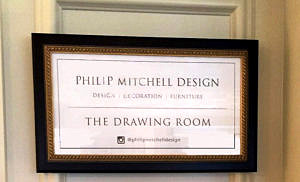 On the floor below that was our highlight of the day: the Drawing Room by Philip Mitchell Design. OMG Just when I had practically convinced myself that my days as a retailer were numbered because the upcoming generations don’t collect things, don’t want things, don’t need stuff–Philip Mitchell’s Drawing Room was the bomb. 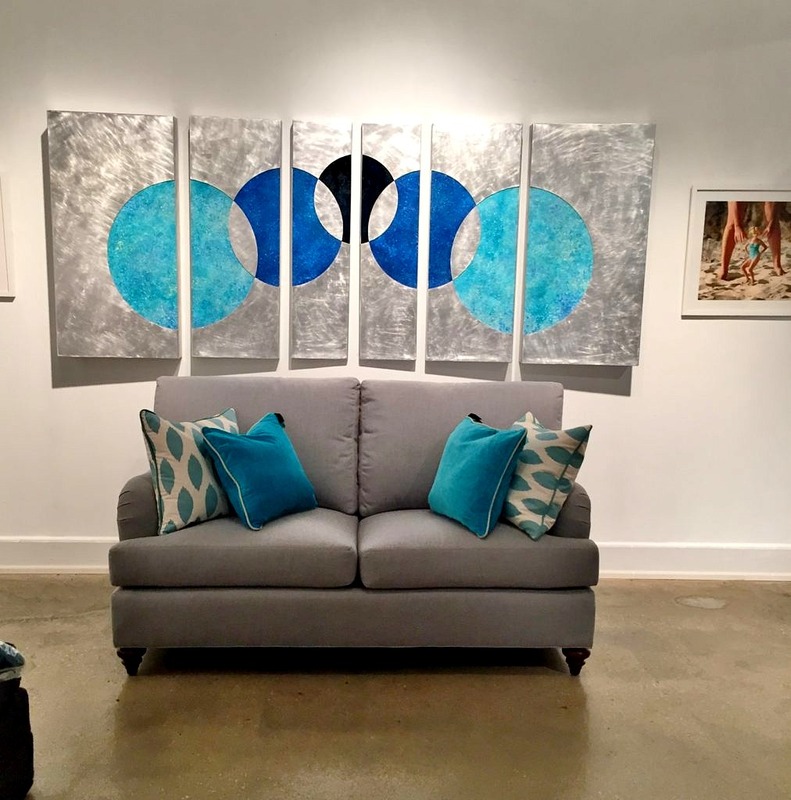 Anchored by a massive navy blue sectional festooned with a plethora of toss pillows bordered by a seemingly random selection of art, it was love at first sight. And it kept getting better. Everywhere you looked there was more, and, impossibly better, accoutrement. 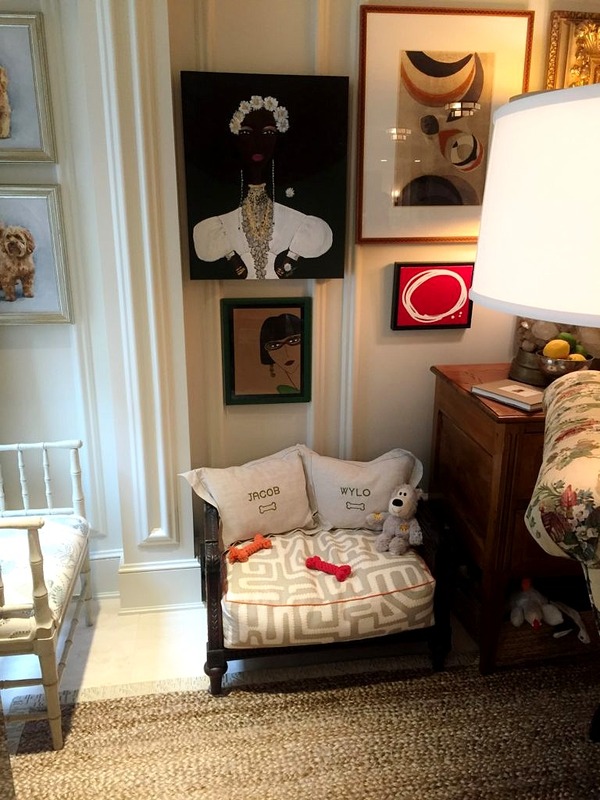 I’ve always loved the Bunny Williams bar set up in her Connecticut house and this was to rival that. 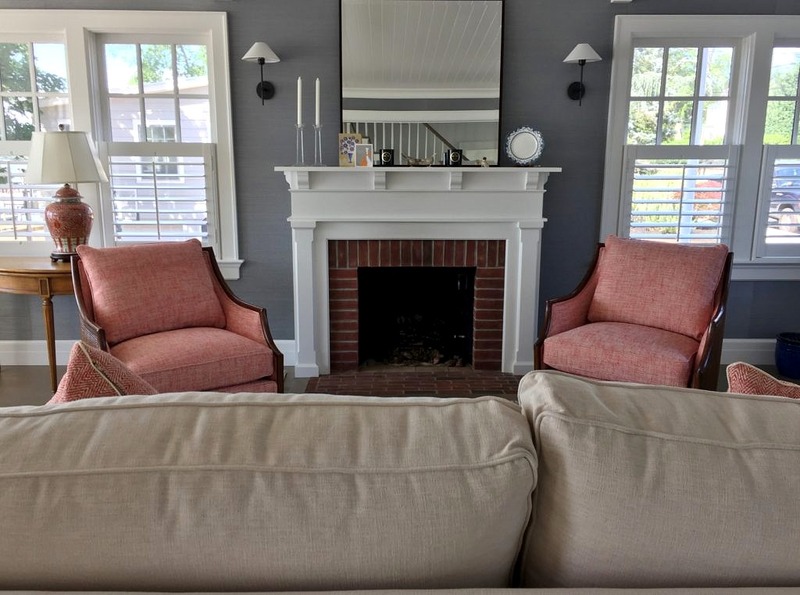 Then there were the overstuffed chairs, flanked by baskets filled with books and magazines, flanked by ottomans, flanked by tables, flanked by–you get the picture. 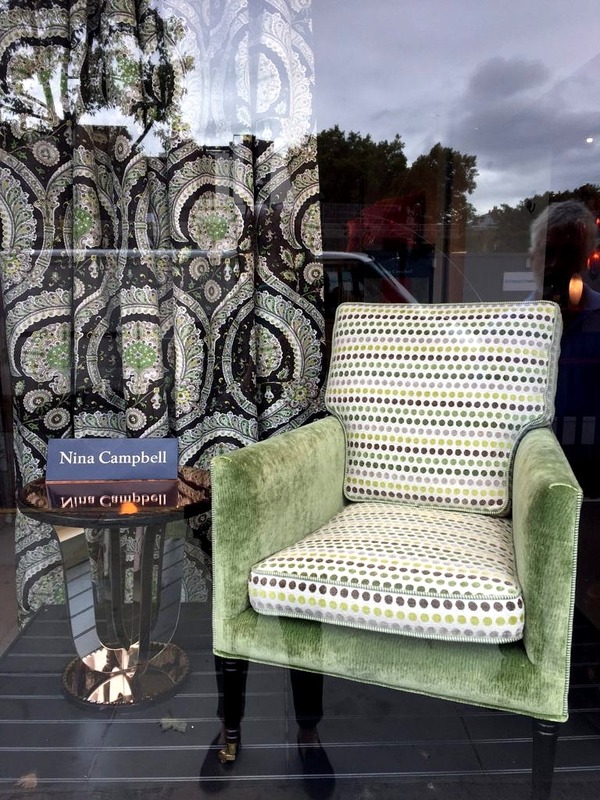 I could just see myself sitting in this chair, feet elevated, sipping a Gin Fizz, devouring a juicy novel. 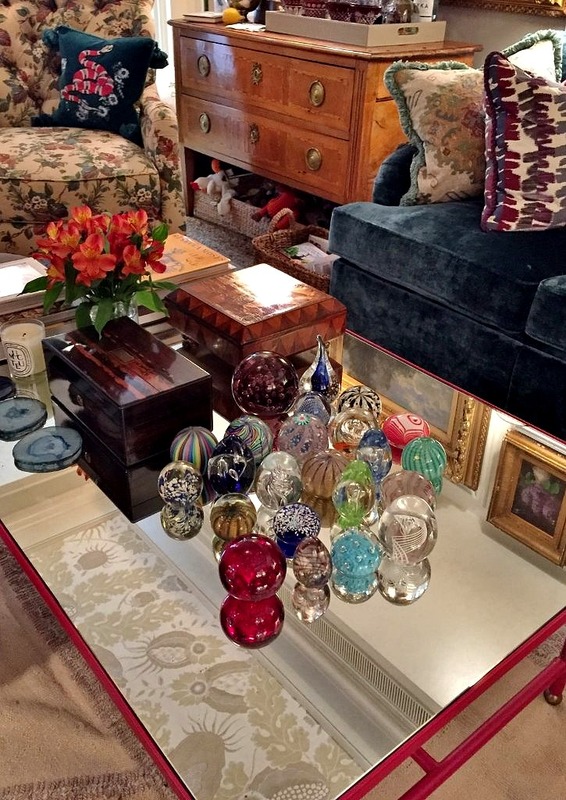 Coffee tables were all piled high with collections (note to self– take all unpolished antique brass candlesticks out of purgatory stat), more books, even plants. Who said orchids were so over? 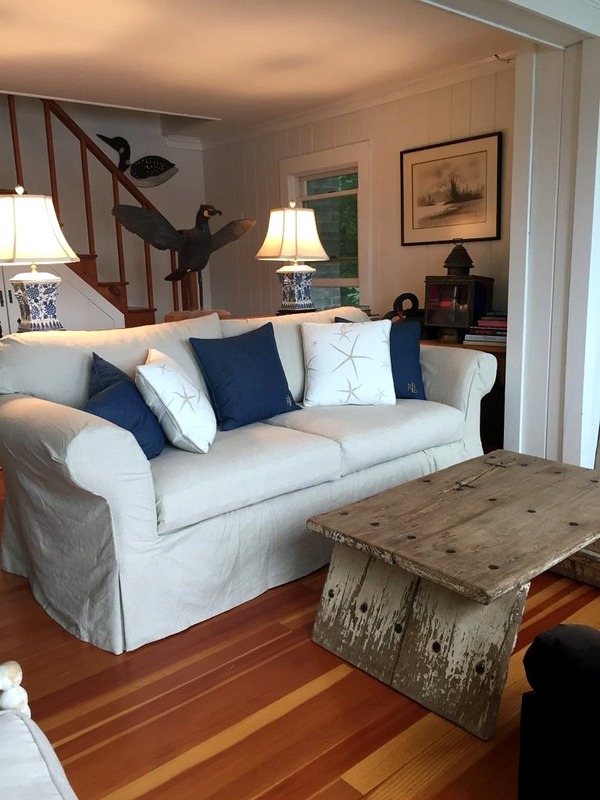 Note too all the stools and benches encircling the coffee table practically begging you to put your feet up and enjoy the flow. Everywhere you looked there was more to see and enjoy. 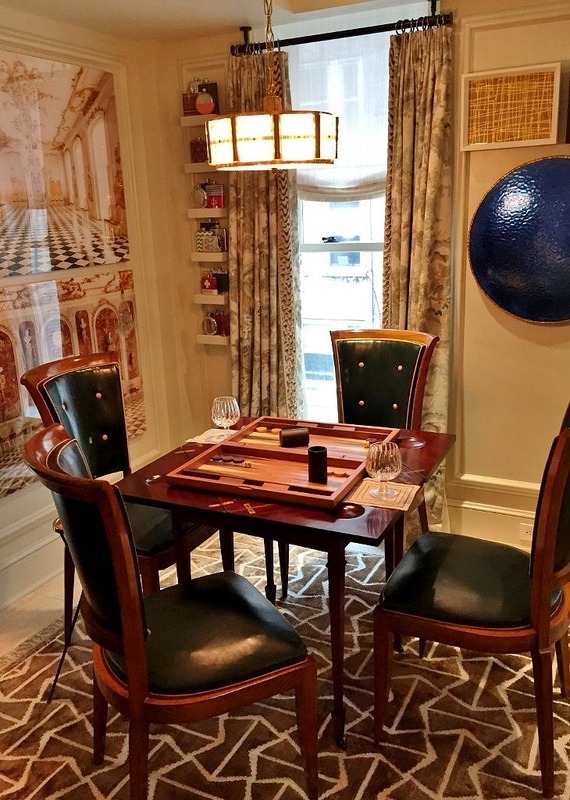 Game table. Check. 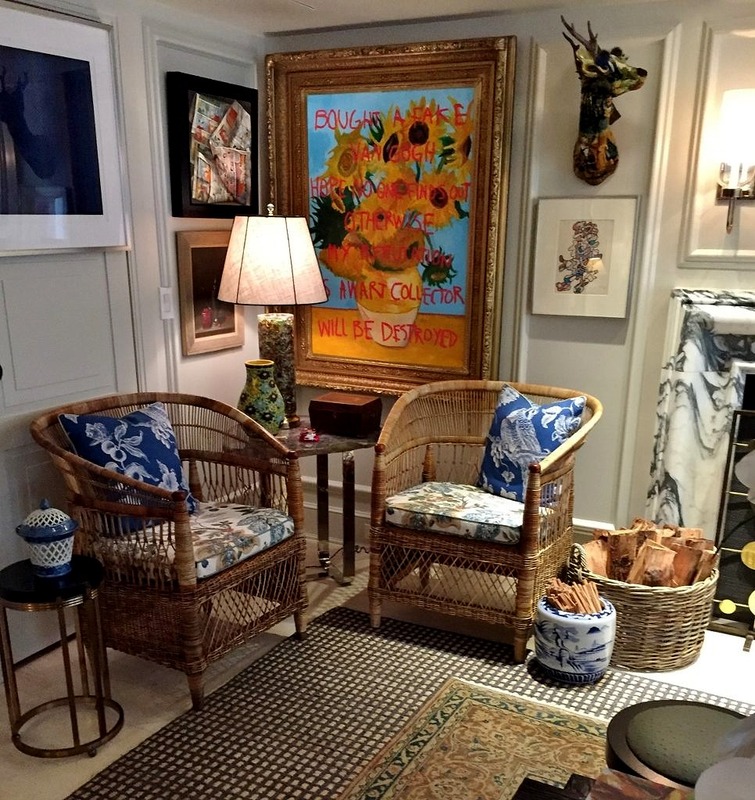 Cozy corner with wicker chairs. Check. 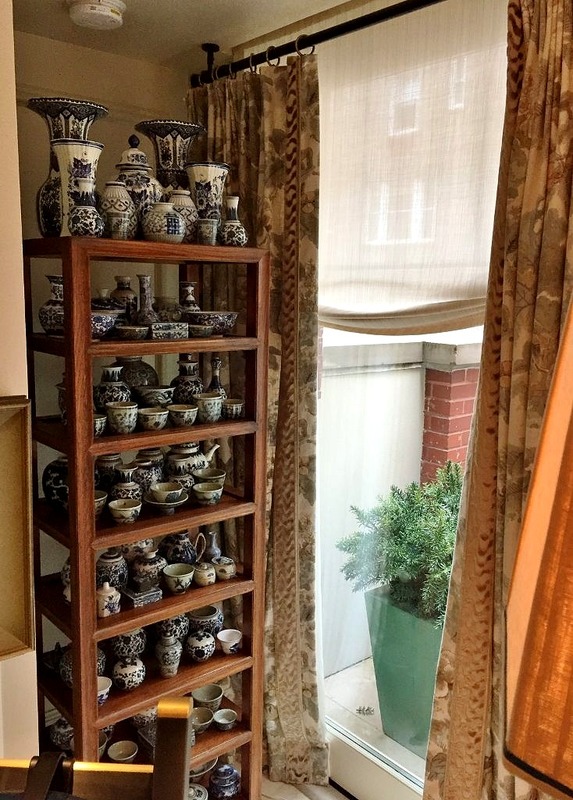 Tall shelf nestled in alcove filled with blue and white porcelain. Check. Vintage dog bed. Check. I could go have stayed there forever but there were seriously another twenty or thirty rooms left to peruse so off we toodled. Mark Sikes was up next. 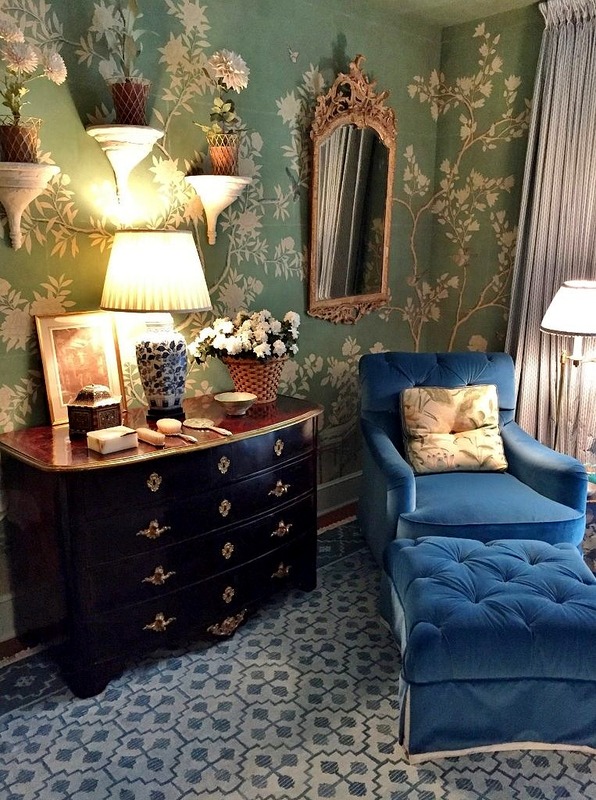 Part of Mark’s shtick is his adoration of iconic beauties and he rolls with the idea that one of those lovelies has this totally gorgeous bedroom. 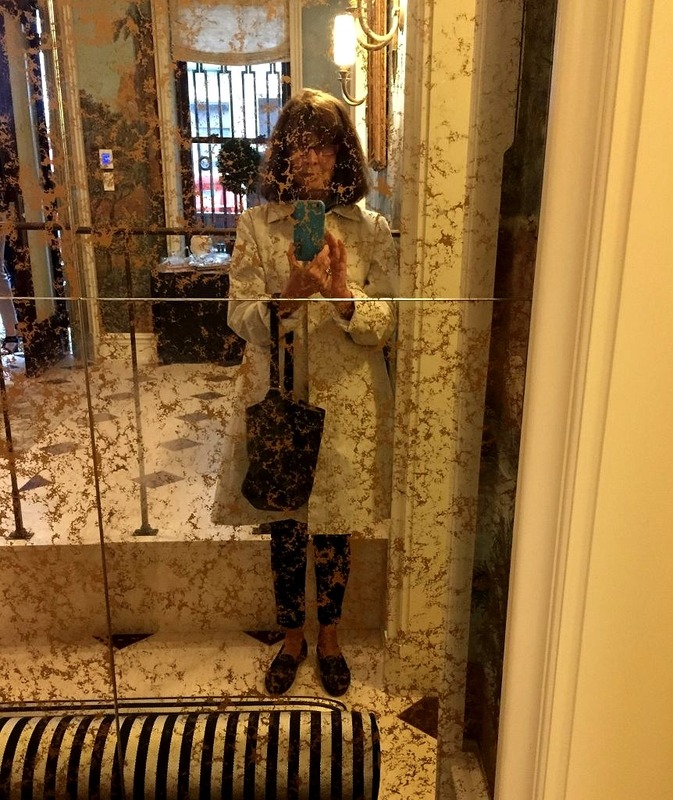 It worked for me, not an iconic beauty however, but still a lover of blue and white, fab wallpaper, incredibly detailed soft furnishings, vintage objets d’art and antique furniture. The four poster bed was gorgeous, and I love how the base is upholstered to match the headboard and footboard. Pops of royal blue abound, and just imagine sinking into this upholstered velvet armchair after a glam evening out on the town. 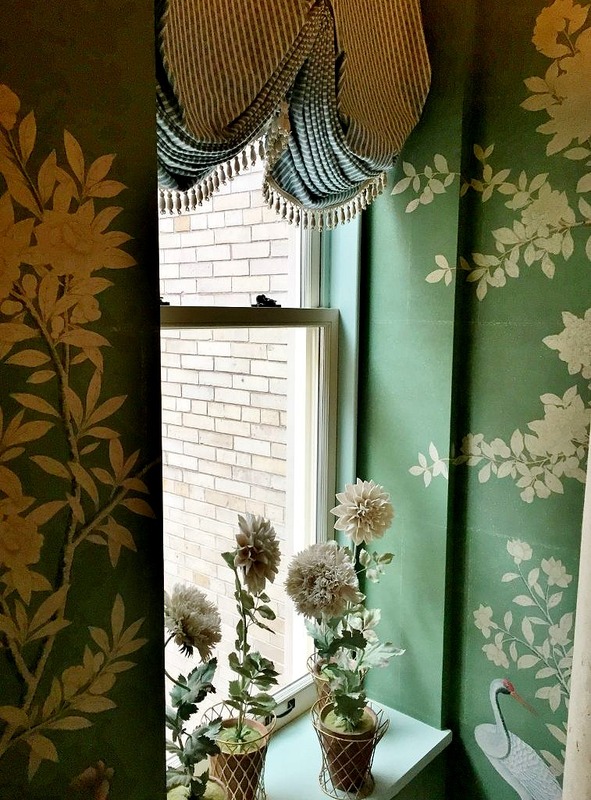 I’m not really a huge fan of complex window treatments but l was bowled over by this pinch pleat swag curtain that probably has a proper name–probably French–c’est tres jolie in any case. 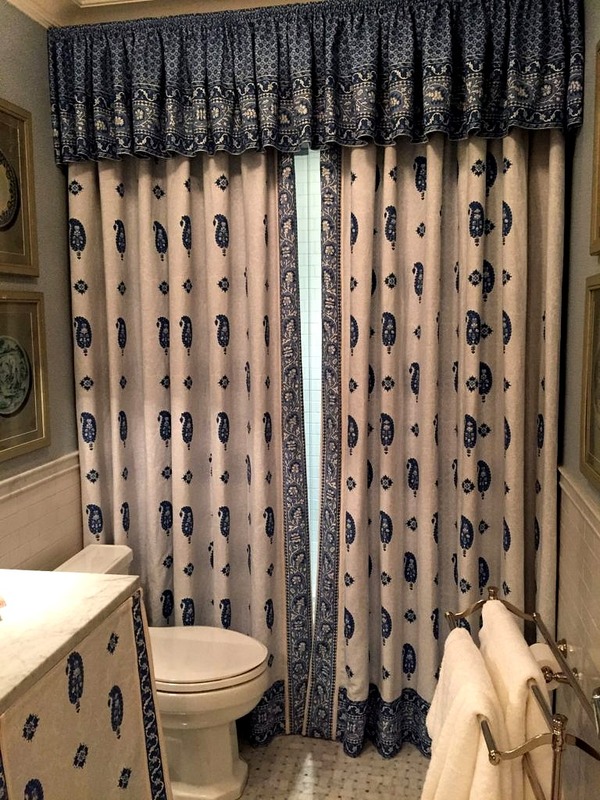 Mark used a contrasting fabric as a shower curtain and skirt for the bathroom vanity which I gather is all part of his new fabric collection for Schumacher. Well done! We hated to leave but Alexa Hampton was waiting–not really–but her room was the next on our A list. 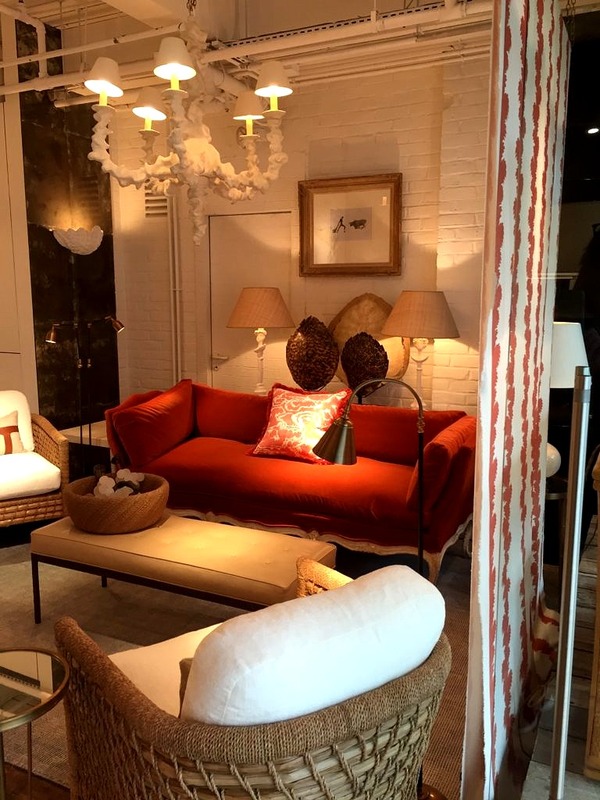 Alexa has been on our British Cottage radar ever since we fell in love with her collection for Hickory Chair last spring at the High Point Furniture Market. 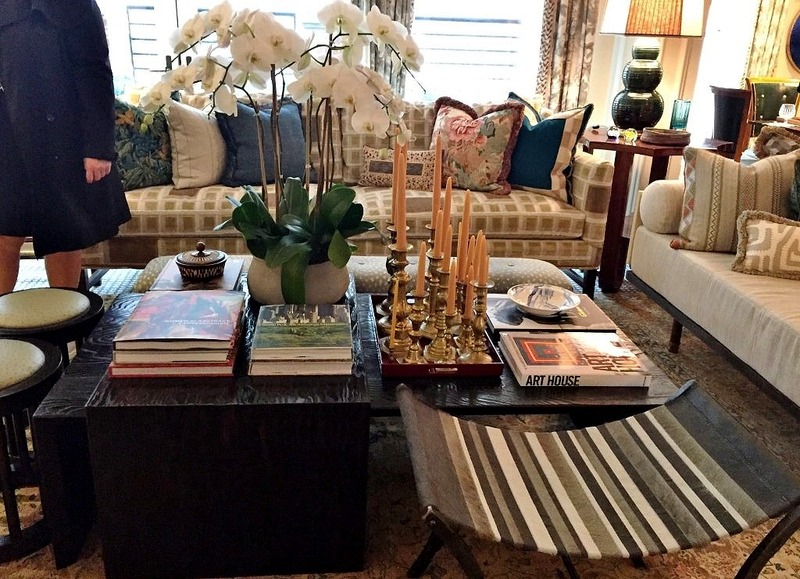 Rich in color and texture, sophisticated and inspiring; we couldn’t wait to see her Kips Bay living room. 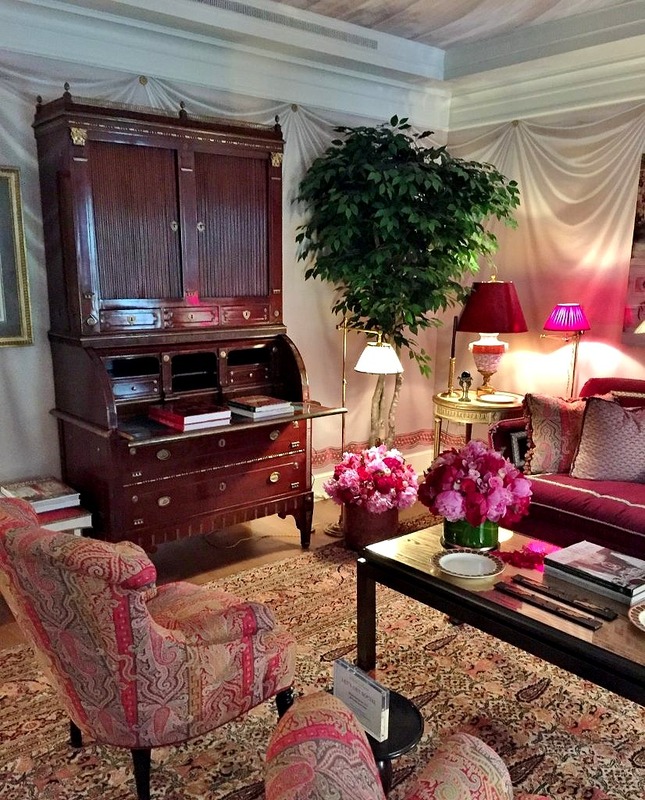 Decorated to the nines and terribly chic, I get it; but sadly it could not make my heart sing. Definitely my fault because I am not very fond of red. And that is all I see here. So even though I love love love the secretary, and all the attention to detail… In the end it was all too fin de siecle for me–but I embraced the opportunity to see a master’s work. 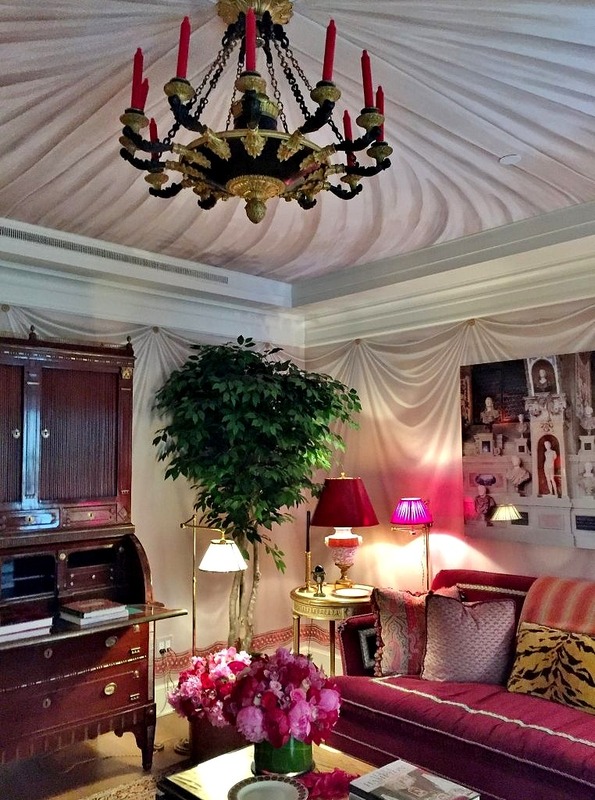 I had to marvel at the artistry that created the tromp l’oeil painted tented walls–and ceiling! And the vision and creativity of the designer to put this all together. And that is the point of showhouses (beyond of course the charities they support). You get to actually see and experience a variety of decorative options. Some may be out of your comfort zone or beyond your budget. But you get to get the idea. 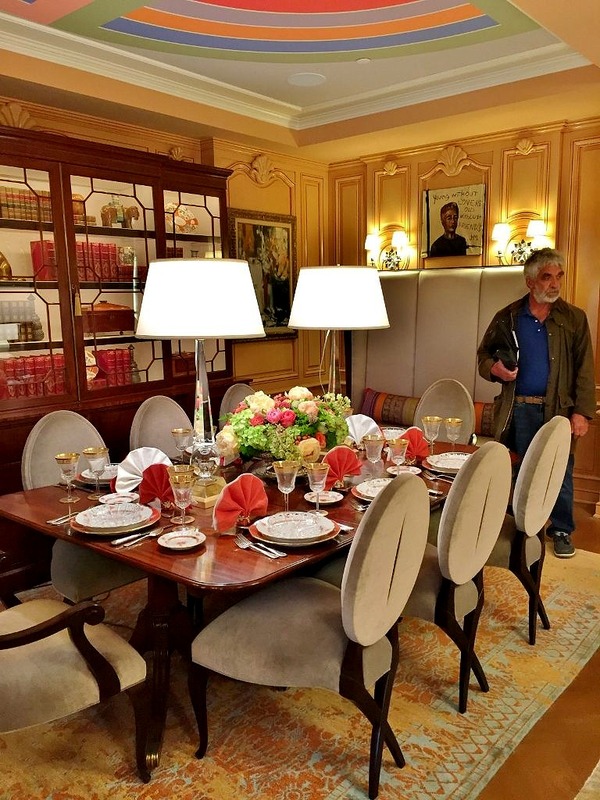 I loved the placement of furniture and all the objects in her room, which I think may have been intended as a formal dining room, but Barbara being Barbara threw in a living room as well. The dining section features a beautifully set table–another Barbara-ism. And note the Andrew Tedesco mural on the ceiling. 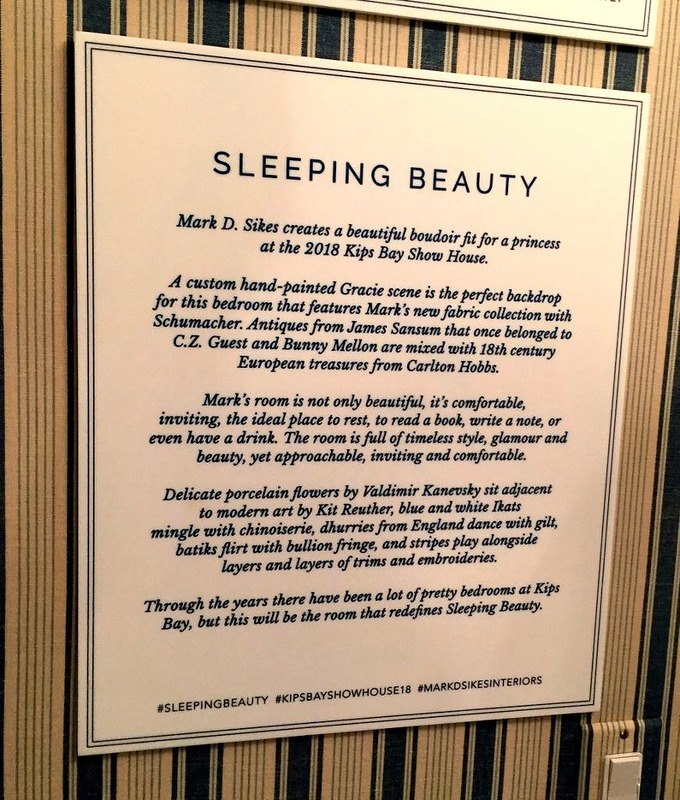 Like many of the Kips Bay designers the ceiling was treated as a “fifth wall” and it was literally a highlight of the entire room. 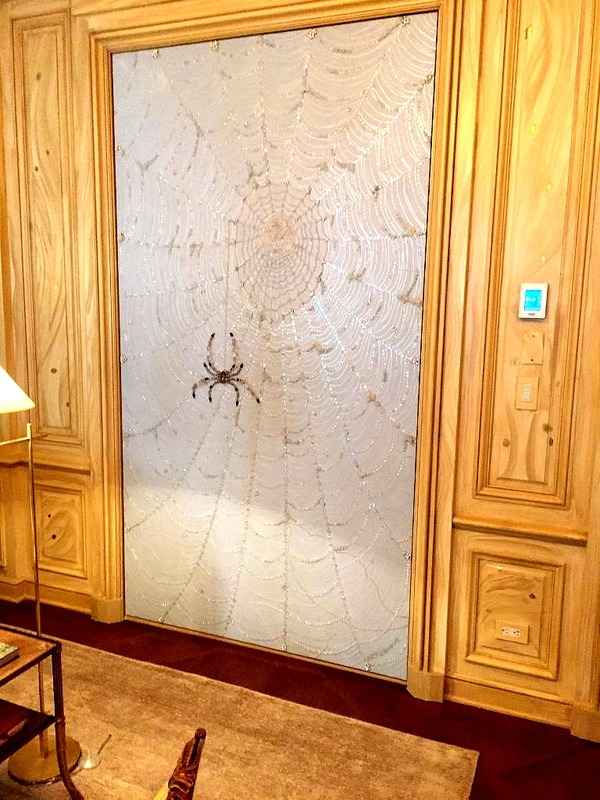 And speaking of stuff, Barbara is fearless when it comes to decorating a room. The paintings are from all periods, including one by John Mellencamp, while the bibelots range from the Han dynasty to the present day. 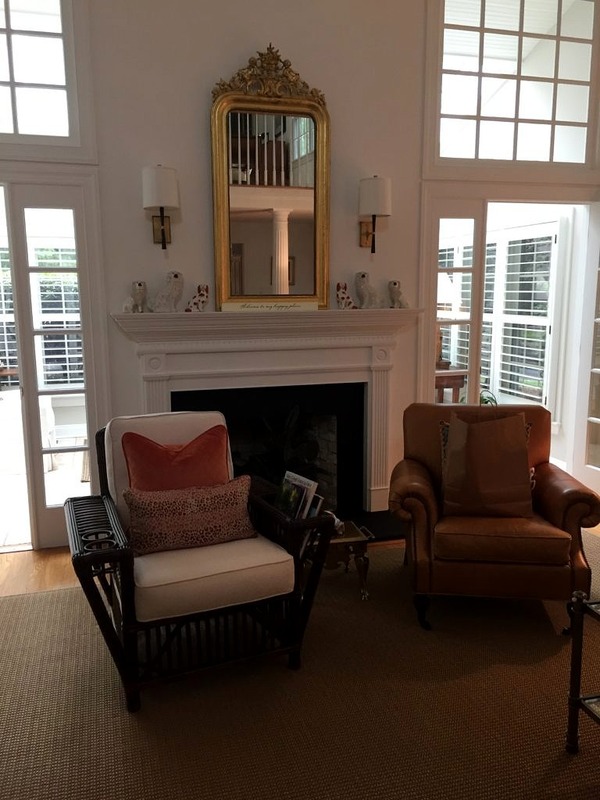 As always the color palette is on the vibrant side; in this case high gloss peach from the Farrow and Ball archives. But I am sure if you are still reading you are wondering if I am ever going to wrap this up. 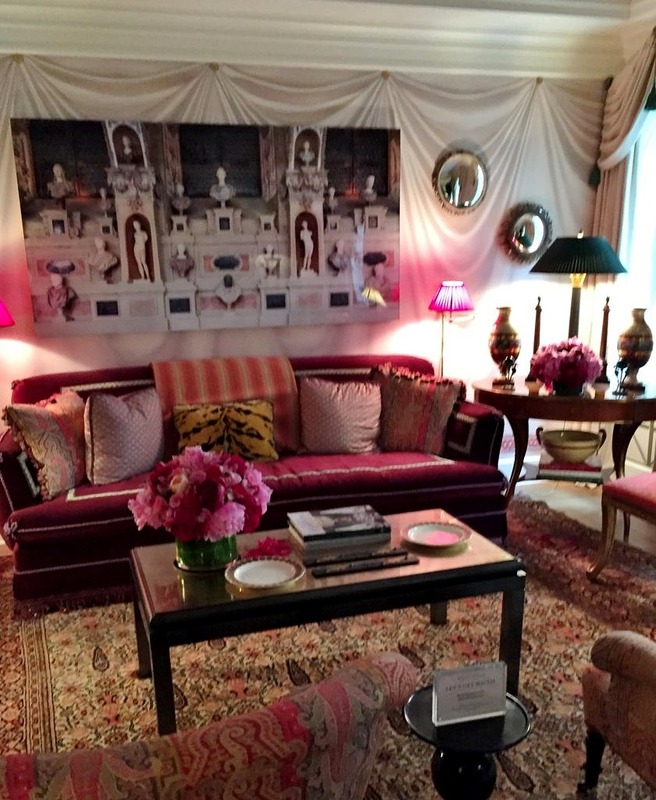 Let’s end with Bunny Williams, co-chairman of the 2018 Kips Bay Showhouse and designer par excellence. 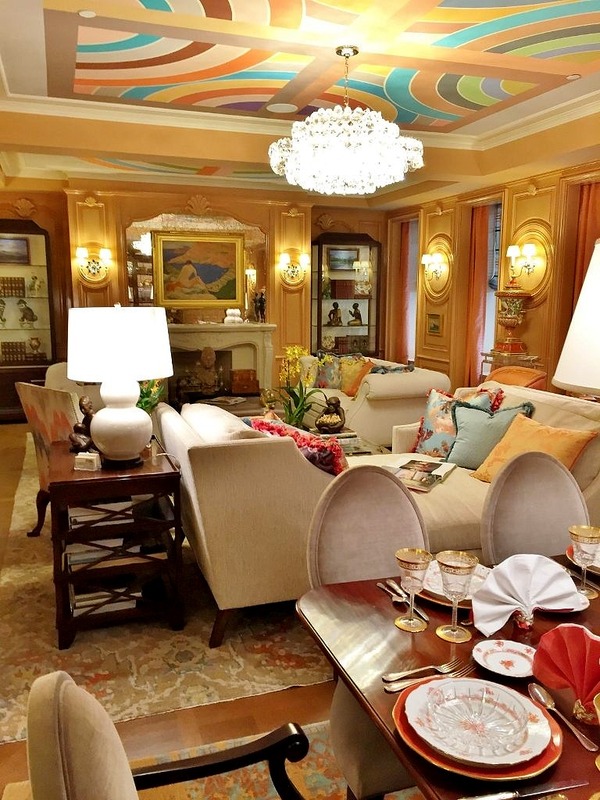 Bunny and her partner Elizabeth Swartz designed a room that was not a fantastical representation of anything–it looked to me like what I think a real life mogul would have in their real life living room in their 51 million dollar mansion off Park. Sophisticated, sleek, expensive, but still relaxing. A place to loosen your tie, plop your feet up and wait for the butler to bring your slippers and serve you a martini made just the way you like it. 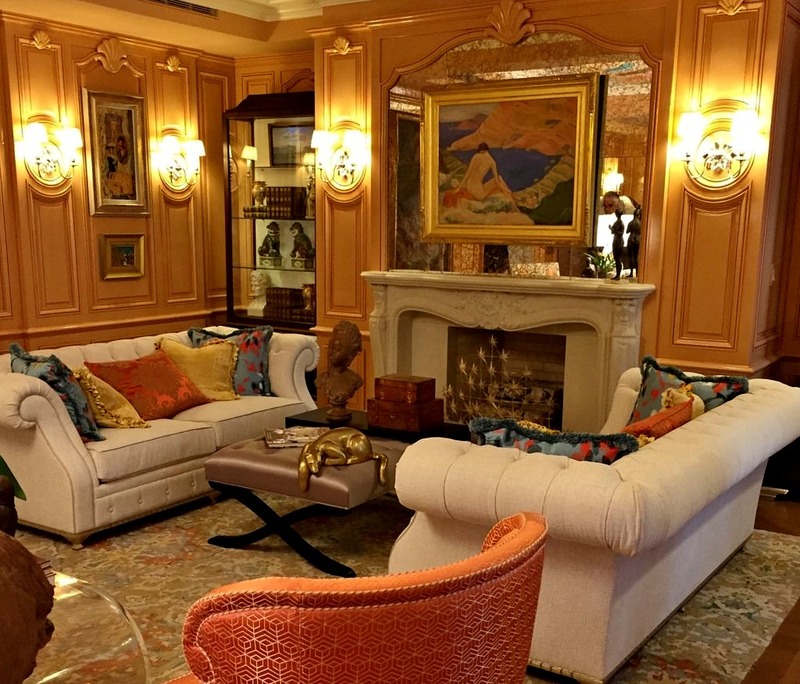 There were two comfortable seating areas, fabulous art on the walls, a mixture of antique and contemporary furniture and some pops of color but nothing too too. Meanwhile I just have to tell you about our brunch. You simply cannot go to New York on a Sunday and not have brunch. We didn’t have plans and fortunately stumbled upon a Belgian Brasserie at 240 East 75th Street almost immediately. Honestly it did not look the most engaging of venues, but it was drizzling, we were parched and famished so in we went. 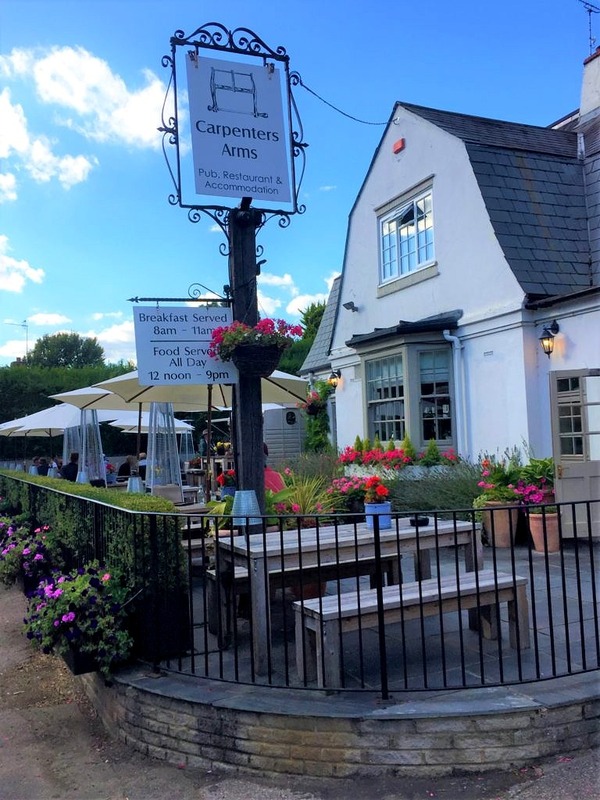 The good news: the interior was spotless, our server excellent and the food terrific. I had my own mini Quiche Lorraine while Keith had French Toast from heaven. 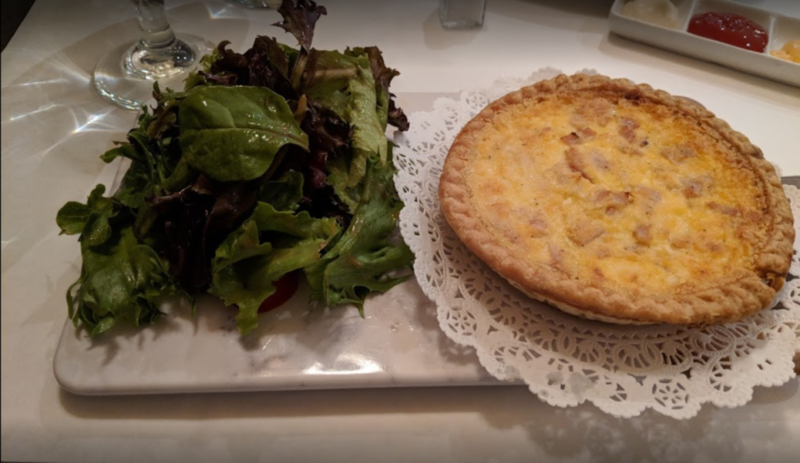 Thanks to Nicole Holland, I can show you how the Quiche was served. I always include a recipe in my blogs and seeing as I already featured Challah French Toast I think it has to be the quiche. My problem is although I love quiche I’m not very good at making it. Here is a recipe from Epicurious that might change that. However, I would use ham instead of bacon, like they did at the B. Cafe. Chop bacon and combine with cheese and onions, then place mixture in pie shell. In a medium bowl, whisk eggs, cream, salt and pepper then pour into pastry shell. Bake for 15 minutes in preheated 425 degree oven. Reduce heat to 300 degrees and bake for 30 more minutes. Our New Shipment has Arrived!